This book presents the intriguing stance that studying abroad can be used as an opportunity to “make a comeback” or turn an unfavorable situation around and start over. In fact, the brief introduction to the book on the publisher’s website suggests that study abroad is not merely for outstanding or elite students. It can also be for mid-career level employees, middle-aged individuals or people in unfavorable circumstances looking for solutions (IBC Publishing, 2018). In order to demonstrate such, certified study abroad counselor Takano Mikio primarily draws on case studies and a variety of study abroad alternatives. After initially defining what is meant by gyakuten no ryuugaku in the introduction, the book is divided into three chapters with the first addressing all the apprehensions one might have about studying abroad and answering all the frequently asked questions. The second chapter then explores a variety of study abroad options and introduces relevant case studies. The third chapter offers advice and outlines the mental preparation necessary for studying abroad. Then, to end on a profound and personal note, the book closes with additional contributor Nakao Yuri’s inspiring account of her own comeback experience as a struggling student with Asperger syndrome who managed to make a complete turnaround by studying abroad. Given that Gyakuten no Ryuugaku has only been published in Japanese and exclusively highlights the struggles of individuals in contemporary Japanese society, it is ideal for readers of all walks of life who are both living in Japan and seeking a little push or motivation to study abroad. As noted, the introduction clarifies the overall meaning of gyakuten no ryuugaku. Takano essentially sees studying abroad as a means to turn the tables or get back on track per se. One’s age, background or circumstances are irrelevant. What is interesting, however, is his argument that Japanese society is rather inflexible and not everyone can adapt or fit in, but studying abroad can open doors and help people realize their potential (2018, p. 4). Takano particularly criticizes the conventional styles of lifetime employment in Japan or at least the obligation to be chained to a company or work under horrible conditions for the sake of stability because it is simply “comfortable” (p. 6). This is reinforced later in Chapter 3 when Takano states that one of the greatest problems of Japanese society is the fear of straying from a stable path, and thus praises the West’s positive attitudes towards failure, tendency to embrace diversity and overall open-mindedness (pp.162-163). While studying abroad can be perceived as an escape from the rigid structures and circumstances in Japan, Takano argues that it is nevertheless a second chance or “game changer” (pp. 5-6). In a culture where changing jobs is not unheard of but not overly encouraged, this perspective may be enlightening and inspiring for individuals who are at their wits’ ends or have simply burned out. Following on from what seems at times like a counseling session in the introduction, Chapter 1 addresses most of the major concerns or qualms about studying abroad one might still have even after being convinced that it is worthwhile. Topics in this chapter include: English proficiency issues, what one can gain from studying abroad, how even individuals in the most negative of circumstances can benefit from studying abroad, the importance of being flexible about one’s choices and paths, why one’s experiences abroad are essential in a globalized society, the lack/existence of programs to suit everyone’s needs, the role of the study abroad guidance counselor, the price of tuition and the cost- performance of studying abroad. By remaining ever positive in tone and providing solid statistics and persuasive anecdotes and arguments, Takano illustrates the overwhelming number of advantages over the financial burden of studying abroad, which, he adds, can be equivalent to the costs of studying in Japan in some cases (p. 37). 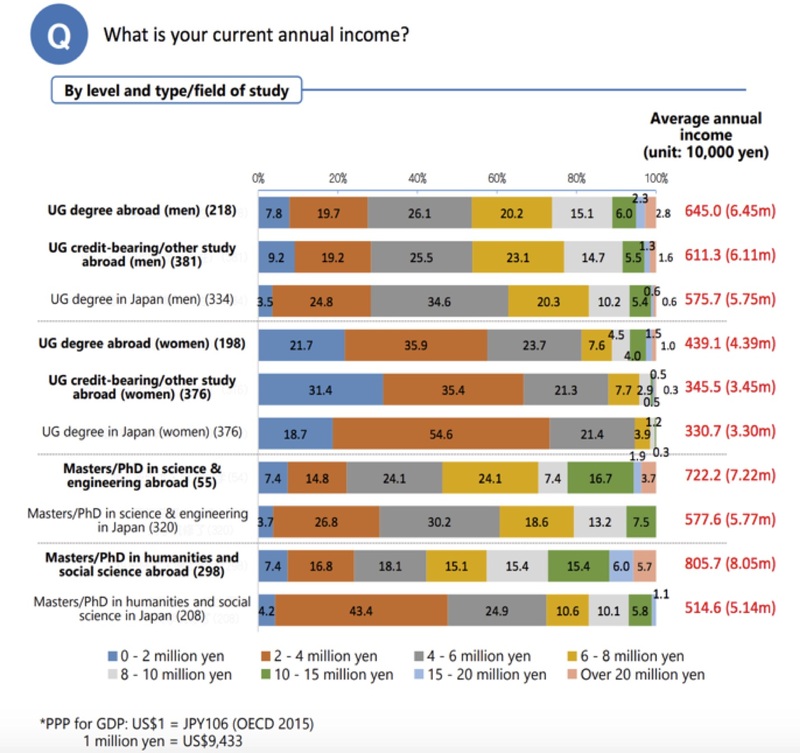 To reinforce this, on page 39 he ends the chapter by drawing in findings from research by Yokota (2016) demonstrating that the average salary of Japanese employees is higher for graduates of foreign rather than domestic universities (see Figure 1). In a rather indisputable fashion, Takano proves the long-term benefits of studying abroad are worth the investment. While providing solid facts and quantitative data lends Takano’s arguments credibility, to really reach the book’s target reader and effectively make the case for studying abroad, the inclusion of case studies in Chapter 2 is particularly commendable. Giving a voice to or personalizing study abroad experiences is arguably one of the most effective means of influencing readers as it encourages reader empathy and greater reader investment. However, while case studies can be convincing and/or capture the reader’s attention, “they are not generalizable; a case—no matter how well done—cannot tell you whether it is the only such instance or whether the problem (or success) is widespread” (Morra & Friedlander, 1999, p. 3). In any case, given that Gyakuten no Ryuugaku provides a number of generic yet relatable case studies, it caters to a range of readers with different backgrounds and needs. The case studies include: studying at a language school, studying at a foreign university, studying at a high school abroad, studying at a sports academy, getting a diploma or certificate abroad, going to graduate school abroad, and joining a short-term study abroad program or summer camp. Evidently, a wide range of age groups are covered in these case studies—from junior high school students (summer camp or short-term study abroad programs) through to middle-aged or mid-career level workers needing a change of scenery or looking for a career change. Every one of the case studies involves an individual who is having trouble or feels out of place in their current school, workplace, or life in Japan. They are generally concerned about their future and seem to be at a loss as to what to do with their lives or current situations. To address these issues, Takano introduces a wide variety of options while ensuring that he also covers any associated concerns one might typically have regarding cost, length, and language proficiency. One of his strategies in this chapter is to highlight what he sees as the major flaws in Japanese institutions and society and then proceed to demonstrate how things are done differently, if not better, abroad. One of the notable points is his criticism of the reputation of Japanese universities for being difficult to enter but easy to graduate from (p. 64). Adding onto that, Takano highlights the fact that although some Japanese universities are listed high in the World University Rankings, most are so lowly ranked (between 600-800 of a total of 1103 universities) that one is better off studying at the University of Manchester or Sydney. That way, Takano argues, students can essentially kill two birds with one stone by both gaining skills and knowledge necessary for their careers and improving their English (p. 67). In his case for studying at a high school abroad, Takano brings to attention the phenomenon of futoukou (a Japanese word meaning students who refuse or stop going to school). Acknowledging that each student’s reasons may vary, he nevertheless notes that even if some of these students decide to go to another school in the hope that things will be different, many fall back into the same rut (p. 86). Part of the problem, he suggests, is Japanese society and its way of thinking. Therefore, studying in a new environment in which the culture, ways of thinking, and relationships with others are completely different is refreshing, eye-opening, and highly recommended (p. 86). Overall, the content and tone of this chapter is critical and encouraging but never condescending. As a result, readers might feel reassured that they are not alone and that there is a range of options available to them. Making that big step to study abroad or hop on the road to recovery just involves getting out of one’s comfort zone. As mentioned earlier, Chapter 3 discusses the mental preparation necessary for studying abroad. Needless to say, learning and living in another environment is not exactly a walk in the park and for anyone uncertain about their future or suffering from anxiety; it is an incredible leap to make. While acknowledging this, Takano dedicates this chapter to offering honest advice to his readers. First of all, he constantly stresses that without great motivation or effort, nothing will be achieved and nothing will change (p. 152). Interestingly, he also adds that crime or danger should not be considered an issue or hold anyone back since Japan is just as dangerous if the frequency of natural disasters and political tensions with North Korea are taken into account (p. 153). Furthermore, with Japan’s rapidly ageing society, the growing presence of foreign employees working in Japanese companies and Japanese firms expanding their businesses abroad is inevitable. Thus, in this context, being open-minded and being able to communicate with a greater number of people is critical (pp. 154-155). Coming to terms with this situation is, according to Takano, part of the mental preparation process. Another issue that Takano considers is the fear of failure, or the fear of not being able to redeem oneself, that are both so prevalent in Japanese society (p. 163). For Takano, experiencing life in a tolerant society that embraces diversity and sees failure as growth can lead one to their recovery or help one make their comeback. The final chapter, as noted, is a personal account of a young student, who, in spite of her struggle in Japanese schools, managed to make a complete turnaround by studying abroad. Until she was diagnosed in her late teens, Nakao Yuri struggled for most of her life with Asperger Syndrome and eventually stopped attending school. Her account in this chapter centers on the discovery of her illness, her eventual graduation from high school, and her aspiration thereafter to enroll in the University of York’s Psychology in Education course. Rather than the ends, it is the means (or the process) that is emphasized in this chapter. If anything, this chapter follows on from the previous chapter in reinforcing that effort and motivation are essential if one has any hope in making a comeback. While the cases in Chapter 2 were anonymized, the personal touch in Nakao’s account is honest, real, and inspiring. Nakao is an atypical study abroad student, and in the face of adversity and in a society that encourages conformity, this chapter demonstrates that sometimes the only way to make a comeback is to both think and venture outside the box. All things considered, perhaps this book does not present any groundbreaking information, but it does offer sound advice and general insight on study abroad options for Japanese people who are struggling or seeking options or solutions to turn their lives around. If there are any shortcomings, it is perhaps the Anglo-centric angle. While studying English and/or other subjects in English-speaking countries is the primary goal for most Japanese people considering a study abroad program, one cannot discount the importance of learning Asian languages and/or other European languages. In addition, the assumption that people in the West are generally open-minded or flexible is, needless to say, problematic. Another issue is perhaps the fact that Takano seems to insist that the way society works and the unfavorable circumstances for some people in Japan is unlikely to change and that going abroad is the ultimate option or solution. Disregarding the root cause and going elsewhere (rather than perhaps confronting the problem and trying to make positive changes) is neither proactive nor is it a sustainable strategy. Nevertheless, both easy to read and packed into a neat little manga-length book, Gyakuten no Ryuugaku is digestible and informative. Rather than regurgitating the information already available in most study abroad handbooks, the balance of case studies, social criticism, and factual data is insightful and inspiring. While I suggested that it is ideal for readers who are both living in Japan and need a little push or motivation to study abroad, Gyakuten no Ryuugaku is a useful resource for not only study abroad counselors, but for counselors in general, too. Rather than focusing on language acquisition and global human resource development, the emphasis on more personal reasons to study abroad is commendable. As for English instructors in Japan who might interact with the target readers of this book, this book not only offers insight into gyakuten no ryuugaku as a concept and phenomenon, but it is a valuable tool in making anxious students aware of the various options that are available to them. Currently based in Tokyo as an English professor at Asia University, Antonija Cavcic belongs to the growing body of scholars interested in manga studies. While her main research interests include dōjinshi publishing practices and manga as a pedagogical tool, her recent research interests concern the branding of ESL in postwar Japan through to Japan’s current post-bubble economic climate. Morra, L. G. & Friedlander, A. C. (1999). Case study evaluations. Washington D.C.: World Bank, Operations Evaluation Department. Takano, M. (2018). Gyakuten no ryuugaku [Studying abroad to start over]. Tokyo: IBC Publishing. I have always been a bookworm; I have loved reading since childhood. I have constantly surrounded myself with books, and it has never been difficult for me to read anything in Japanese, which is my native tongue. However, learning how to read fluently in English has been a very different story. Although I have always wished to be able to read comfortably and smoothly in English, and am close to believing I will achieve that dream someday, I have not had a clear plan to reach that goal. I sometimes feel like a butterfly flying around without a map or destination. In this paper, I will discuss part of the story of my language learning process, focusing on my ideal L2 self for reading as well as my motivation to reach this optimal endpoint. The first question I need to ask is, however, can anyone have a clear plan to become a fluent reader at an advanced level in a second language? Indeed, Larsen- Freeman and Cameron (2008) suggest that although we can write about a learning process, we cannot predict it. With that in mind, this is a story of my learning history on the way to becoming a comfortable reader in English, but not a story to show how other L2 learners can achieve that goal. Like many Japanese, when I entered junior high school I began to study English. Yet, I must admit that I struggled with this subject throughout my secondary schooling. I hated English classes, and simply stopped learning it in college. However, my life took a new turn when I visited New York, and I realized that I would need to know English. As a result, I once again started to learn English in my twenties. I listened to an NHK radio program for a decade and studied English speaking skills at a language school for a few years. At the same time, I studied English reading with a private tutor for a year, and I always practiced reading English on my own. I recollect that I wanted to read a book in English for pleasure and asked some ESL experts at a conference how to improve my reading skills. Some told me to engage in reading repeatedly, which sounded rather boring to me. I never practice reading repeatedly. Others suggested doing speed-reading, in which I should hold a stopwatch while reading a given text. I never did speed-reading. I seldom read graded readers. Instead, I just read as much as possible without stopping. It took me a decade to become a comfortable English reader. These days, I enjoy reading newspapers and love reading paperbacks in English. When we were students, we were encouraged to look up words in a dictionary as often as possible. Japanese people often mention that they have read some books in a second language while using a dictionary. These days, even adult Japanese learners understand extensive reading, and they enjoy reading graded readers. However, many Japanese people still seem to believe that reading a book in a second language requires looking words up in a dictionary hundreds or thousands of times. I have found hardly any stories of learners who have become fluent readers in a second language. Thus, I have not found a role model for reading English fluently. However, as I mentioned before, I am a good reader in my native tongue and I love reading books. Therefore, I know what it means to be a comfortable reader, and I could imagine being a fluent reader in English just as I am a fluent reader in Japanese. When we look at essays written by Japanese adults, we realize that most of them mention a desire to be able to speak English fluently. Even though the essay writers have studied English in school for six to eight years, few actually speak English. Many Japanese adult learners work hard to become fluent speakers in English. For instance, in her book, Chusonji (2005) mentions that she tried hard to learn English in her thirties and experienced several failures, and it took her ten years to be able to communicate in English accurately and comfortably (pp. 54-64). She has achieved her goal, which she dreamed about for a decade. However, one wonders if she has actually always had a clear achievable goal and worked hard to achieve that goal. I am not sure that speaking English fluently is “a real goal” for language learners. It does not seem realistic. And dreaming of becoming a fluent English speaker does not sound like having an achievable ideal L2 self. Henry (2016) mentions that “changes in the ideal L2 self are likely to be taking place all the time” (p. 84). Meanwhile, many adult Japanese learners always mention that they wish to speak English fluently and that is their only goal. Only when one can speak English fluently can they say they have succeeded in learning English. Even in this situation, one might still say that they have an ideal L2 self to learn English. In this sense, I have always had an ideal L2 self for reading in English. After I finished completely reading my first paperback, I continued to read paperbacks to become a fluent reader in English. I read Jane Austin and Time magazine, Bridget Jones and Harry Potter. I have not had a clear plan of how to achieve the goal or known what to do to reach it, although I have asked many people about how to study reading in a second language. Since language learning comes with successes and failures, it is hard to say that high motivations lead to language learning. For instance, Sataporn and Lamb (2004) reported how two learners struggled to take a distance course for learning English, though they were highly motivated at the beginning. Meanwhile, some adult learners have continued to learn a language and achieved their goals. Chusonji (2005) mentions that she studied grammar books for two years and perfectly memorized all of the English phrases in these books (p. 73). Kiyokawa (2006) notes that learning English was her priority in her daily life while she took private English lessons for a decade (pp. 20-23). I do not know why I was able to continue to read books in English. One private tutor at a language school told me that I should read a Readers’ Digest, because my English then was not good enough to read a proper paperback. I changed tutors and continued reading. The new private tutor assigned me a lot of reading materials, and I focused on reading. In fact, at that time, learning English was my main priority. I studied reading English with that teacher for a year and I was greatly encouraged. However, I do not think that their encouragement alone kept me reading English for another decade. I continued reading books and newspapers in English, and one day I found myself reading English without effort. Somehow, reading English has become natural for me. I have just continued to read as many English paperbacks as possible, never stopping. I have had opportunities to keep practicing and to choose interesting books that I wanted to read. I never had a clear plan to achieve my goal, and it took me a decade to become a comfortable English reader. I feel as if I am a butterfly in the wind that has accidentally been sent far away. This is my language learning history for reading in a second language. I would like to thank the editor of Speakeasy, Dr. Sampson, for his useful suggestions about the article. I would also like ti thank Editage (www.editage.jp) for English language editing. Akiko Fujii is a part-time lecturer at the University of Tokyo and Sophia University. She teaches Japanese as a second language. Her current interests include the development of second language reading and teaching Japanese literature as JSL. Henry, A. (2016). The dynamics of possible selves. In Dornyei, Z. Maclntyre, P.D. & Henry, A. (Eds. ), Motivational dynamics in language learning (pp. 83-94). Bristol: Multilingual Matters. Kiyokawa, T. (2006). 84 Years Old, English Language, UK, a Solo Traveler. [84 sai. eigo, Igirisu, hitori-tabi]. Tokyo: Shougakukan. Sataporn, S. & Lamb, M. (2004). Accommodation zone: Two learners’ struggles to cope with a distance learning English course. In Benson, P. & Nunan, D. (Eds. ), Learners’ stories: Difference and diversity in language learning (pp.119-133). Cambridge: Cambridge University Press. Private English conversation (eikaiwa) schools cover the entirety of Japan employing thousands of teachers and representing a multibillion-yen industry (METI, 2017). These schools lie outside of formal educational institutions and are often viewed as an entry-level position for new teachers (Kubota, 2011; Nagatomo, 2016). In this article, I wish to examine eikaiwa’s stigmatized position in our field and explore some of the pejorative images that are attached to this sector. I think at this point it is important to clarify what I do not intend to say. Firstly, I have no intention of claiming that the eikaiwa industry is not deeply troubling in many ways – eikaiwa schools are often exploitative and the way that many schools handle issues of race, native-speakerism, and gender is a major concern (Appleby, 2013; Kubota, 2011). Secondly, this should not by any means be interpreted as an attack on secondary or tertiary education. I currently feel satisfied and well-supported in my position as a university lecturer and believe that I am providing a worthwhile educational experience to my students. I merely hope that through this article I can foster a more nuanced take on eikaiwa teaching and relate my own discoveries on some problematic issues running through our entire field. At this stage, I feel that it is necessary to clarify my claim that eikaiwa is stigmatized in Japan. Rather than relying purely on anecdote and relating derogatory comments I have heard (and made) about eikaiwa, it is important that we also look to popular culture and formal research in order to get a more well-rounded take on this topic. As I mentioned previously, eikaiwa is seen as an entry-level job with few qualifications required and, as such, is regarded as the “bottom rung” of a hierarchically structured field (Nagatomo, 2016). Furthermore, while Assistant Language Teachers (ALTs) in secondary education are largely comparable in terms of qualifications and teaching experience, some argue that eikaiwa is “seen as crasser because it is private enterprise” (Makino, 2015, p.3). Also, in popular culture a number of negative stereotypes ascribed to eikaiwa teachers exist that ensure they remain deprofessionalized and on the periphery. One enduring image known by many in the expatriate community is the “Charisma Man” (Rodney & Garscadden, 2002). Originally from a satirical comic strip, this image of the unprofessional, unqualified Caucasian male eikaiwa teacher, largely playing games in class and more concerned about sexual escapades with Japanese women than teaching, is arguably central to the prevailing view of eikaiwa (Appleby, 2013; Bailey, 2007). In reality the sexualization of Caucasian male teachers is often promoted by the eikaiwa schools themselves (Bailey, 2007; Kubota, 2011), and this can have a demotivational effect on teachers as they feel they have been deprofessionalized and reduced to “language hosts” or “entertainers” (Appleby, 2013; Hooper & Snyder, 2017). Another prevalent negative stereotype leveled at eikaiwa teachers is that their role is more akin to a fast food restaurant worker than an educator. This comparison is also alluded to in the “Charisma Man” comic in Figure 1 as the male applicant with his unskilled fast food experience beats out the professionally trained female educators for the eikaiwa position. Eikaiwa is therefore positioned as a setting where teachers are not only unskilled but, in fact, low-skilled workers (defined purely by race, nationality, or gender) are actually viewed as preferable to trained or experienced teachers. In McNeill’s (2004) Japan Times article, he raises the idea of eikaiwa being an example of George Ritzer’s (2000) concept of “McDonaldization” because he claims that many schools produce a low quality product within a highly-controlled system manned by unskilled easily replaceable labor. In this view of eikaiwa, teachers are reduced to the role of pedagogical “burger flippers” teaching lessons that are “about as nutritious as a bag of salty fries” (McNeill, 2004). 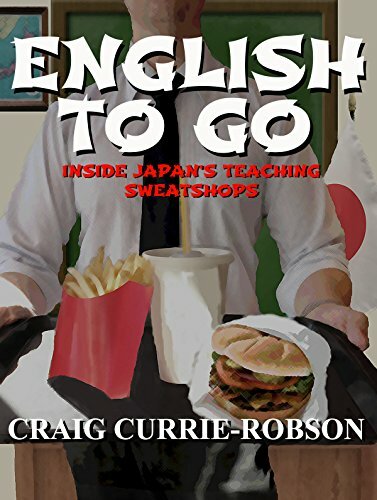 This pejorative eikaiwa/fast food analogy has caught on with books such as English to Go (Currie-Robson, 2015) (see Figure 2) railing against “McEnglish” and online message boards referring to teachers as “Eikaiwa Mcmonkeys (sic)” (Reddit). Perhaps unsurprisingly, eikaiwa has received scant attention in academia (Nagatomo, 2013, 2016) with most of the studies that do exist on the context focusing on eikaiwa schools as “socio-cultural curiosities rather than educational institutions” (Makino, 2016, p. 4). From my own research on former eikaiwa teachers who had transitioned into university teaching, some participants revealed their own awareness of a professional stigma in the field attached to eikaiwa. One teacher admitted that he saw eikaiwa as a “black cloud” over his resumé whereas another teacher stated that: “I think that kind of, um, stereotype or something about eikaiwa, um, in some ways makes it difficult to say, to put your hand up with vigour, “Yes, I did the eikaiwa thing” (Hooper, 2017). In essence then, we have two dominant themes that permeate stereotypes of eikaiwa: 1) the notion of eikaiwa teachers being tokenistic – entertainers or hosts rather than authoritative teachers and 2) a conflict existing between commercial and educational interests – eikaiwa selling a product in response to market forces. I will argue that both of these points when applied to eikaiwa are problematic and by no means limited to the eikaiwa industry. Furthermore I will show how we are able to observe evidence of these issues in many sectors of Japanese ELT and even in the “holy grail” (Nagatomo, 2015) of university education. My first issue regarding the stigmatization of eikaiwa can be addressed with a simple question: What do we mean by eikaiwa? When one attempts to answer this question, they may think of the huge chain eikaiwa companies such as NOVA, Aeon, or Gaba. Indeed, these schools are perhaps responsible for a lot of eikaiwa’s notoriety in Japan and represent the part of the industry most deeply embedded in the public consciousness. However, eikaiwa is a far more varied sector than that and incorporates small family-owned businesses, the cottage eikaiwa industry (Nagatomo, 2013), online eikaiwa, and amateur eikaiwa classes held in public venues like community centers (Makino, 2016). Each of these categories of eikaiwa have their own differences in terms of hiring practices, teaching methodology, standardization, and target students (Makino, 2016), and one could also expect to encounter a significant degree of diversity between individual schools in each category. If this is, in fact, the case, how can one assume that eikaiwa neatly fits the “McEnglish” mold of the chain eikaiwa companies? From my own personal experiences having worked both in NOVA and in a smaller family-run eikaiwa school, the differences in terms of hiring practices, teacher autonomy, and teachers’ qualifications/experience were dramatic. Rather than a slew of “Charisma Men”, some teachers in the smaller school actually possessed Master’s degrees in TESOL and others were regularly presenting at domestic ELT conferences. Makino (2016) claims that an insufficient understanding of what eikaiwa really is has led to it being seen as “pedagogically unimportant” and that this in turn has led to a gap in what we know about eikaiwa classroom practices. An additional point to be considered is that some eikaiwa schools are now outsourcing teachers and courses to secondary schools and universities (Breaden, 2016). This means that the boundary between eikaiwa and what is seen as “real” teaching is more blurred than ever. This leads into the second theme of business vs. education. Due to the crisis of declining student numbers, Nagatomo (2016) claims that university education has become “a buyer’s market” (p.50) where the exoticism of foreign teachers is used as a tokenistic hook to draw in more students. Also, the increased power that students wield as “customers” has led to an increase in feelings of deprofessionalization in foreign university teachers on fixed-term contracts as they feel it necessary to keep their “customers” happy (Burrows, 2007). As I’m sure you have realized by now, this is all very familiar to the eikaiwa teacher in me. As I have previously stated, this article is not an attempt to justify every facet of eikaiwa teaching, nor is it designed to delegitimize teaching in formal contexts. I have merely tried to show how eikaiwa is not a mere pejorative stereotype and is actually potentially just as representative of ELT in Japan as any other context. I feel it is important that we examine the intersection of ideology and pedagogy that takes place in different eikaiwa schools and look at what we can learn from other contexts. Even though we may feel we are “above” eikaiwa, it might be that “McEnglish” is closer to us than we would like to imagine. Daniel Hooper has taught in Japan for 12 years and is a lecturer at Kanda University of International Studies. His research interests are learner/teacher identity, native-speakerism, and the eikaiwa industry. Appleby, R. (2013). Desire in translation: White masculinity and TESOL. TESOL Quarterly, 47(1), 122-147. Breaden, J. (2016). Education and training for the intercultural competence of Japanese university graduates: Policy, practice, and markets in informal education. In K. Okano (Ed. ), Nonformal education and civil society in Japan (pp.133-154). Abingdon, Oxon: New York, NY: Routledge. Burrows, C. (2007). The effect of limited-term contracts on teaching standards at tertiary- level education in Japan. OnCUE Journal, 1(1), 64-73. Currie-Robson, C. (2015). English to go: Inside Japan’s English teaching sweatshops. CreateSpace Independent Publishing Platform. Hooper, D. (2017, November). From “McEnglish” to “the holy grail”: Eikaiwa and university through the eyes of educators. Paper presented at JALT2017: Language teaching in a global age, Tsukuba, Japan, November 18, 2017. Hooper, D., & Snyder, W. (2017). Becoming a “real” teacher: A case study of professional development in eikaiwa. The European Journal of Applied Linguistics and TEFL, 6(2), 183-201. Kubota, R. (2011a). Learning a foreign language as leisure and consumption: Enjoyment, desire, and the business of eikaiwa. International Journal of Bilingual Education and Bilingualism, 14(4), 473-488. Makino, M. (2015). Principled eikaiwa. JALT School Owners SIG Newsletter, 1, 3-8. Makino, M. (2016). A taxonomy of eikaiwa schools. JALT School Owners SIG Newsletter, 3, 4-11. Nagatomo, D. H. (2013). The advantages and disadvantages faced by housewife English teachers in the cottage industry eikaiwa business. The Language Teacher 37(1), 3-7. Nagatomo, D. H. (2015). In the ivory tower and out of the loop: Racialized and gendered identities of university EFL teachers in Japan. In Y. L. Cheung, S. B. Said, & K. Park (Eds. ), Advances and current trends in language teacher identity research (pp. 124-137). New York: Routledge. Nagatomo, D. H. (2016). Identity, gender and teaching English in Japan. Bristol: Multilingual Matters. Ritzer, G. (2000). The McDonaldization of society (New Century ed.). Thousand Oaks, California: Pine Forge Press. Rodney, L. and Garscadden, N. (2002). Charisma man: The complete collection. Tokyo: AKNG Press. Whitsed, C., & Wright, P. (2011). Perspectives from within: Adjunct, foreign, English-language teachers in the internationalization of Japanese universities. Journal of Research in International Education, 10(1), 28-45. In April 2018 after 13 years of being an assistant language teacher (ALT), I made the transition to working at university as a part-time English lecturer. In this paper I will review the experiences and the challenges I have faced in my new position. I will also discuss the core teaching values and beliefs which informed my decisions in the classroom, along with the differences and similarities I perceived between the roles of ALT and university teacher. A teacher should know their subject and be well-prepared and passionate. A teacher should encourage learner autonomy and where possible create student-centered activities in which students can make their own decisions and receive feedback from not only the teacher but also their classmates. A teacher should be flexible and adapt classes to their students’ needs and abilities. A teacher should be constantly self-evaluating their work and be continually evolving their style and methods. Above all, a teacher should create a relaxed classroom environment where students feel comfortable in practicing English with their classmates. In other words, the teacher should develop a rapport with their students and be a motivator as well as a source of knowledge. The Takasaki Board of Education (BOE) dispensed with dispatch companies in 2012. I was hence re-contracted, directly hired by the BOE. However, I was then transferred to a junior high school and for the next six years I worked at five different junior high and elementary schools in Takasaki. The Takasaki BOE was undergoing a period of transition at that time. Many experienced ALTs had to move schools to accommodate the increasing numbers of new ALTs and the introduction of the Takasaki Plan, a syllabus designed for use in almost every elementary school under the auspices of the Takasaki BOE (Ferrier, 2017). Whilst I enjoyed my time working at different schools and learning how to adapt to different classroom environments, I was beginning to feel restless and dissatisfied with my current situation. I had been an ALT for thirteen years and felt that I had experienced and learnt as much as the position had to offer, and that for my own career and personal development I needed a change and a new challenge. In August 2017 I began having discussions with friends and other teachers about possible openings at universities in Gunma and Saitama. Over the next seven months, three teachers put me in contact with five universities and I was able to gain part-time positions at three of them, with eleven classes across the week. The three universities will henceforth be referred to as A, B, and C.
I was immediately challenged upon becoming a university teacher. As an ALT, I had a three-day orientation in Tokyo for the JET Programme, followed by numerous seminars over the years where I learnt from and shared ideas with my peers. In contrast to this, there was an hour-long meeting for English teachers at University A, a general orientation at University B, and no orientation at University C except the interview where I was given a textbook and shown my classroom. Naturally, this made me feel apprehensive but there was no solution other than to learn the different systems and procedures of the three universities and to ask many questions to my more experienced colleagues. Above all, I had to rely on the experiences I had gained as an ALT and my core beliefs as a teacher. In four of my five classes at University A I was given a textbook and syllabus to follow. I taught two grammar classes, one listening class, and a reading class. The students in these classes were majoring in International Communication and there were eighteen students in each class, the classes being separated by ability. As the students were very motivated I wanted to give them as much opportunity as possible to practice the English they were learning with their classmates. Thus, I kept my explanation time to a minimum and allowed the students to practice or perform the language in pairs or groups. In the remaining class, a third-year selective entitled English in Drama, I had free license over what I wanted to teach. I selected five films to show the students. They then discussed them in pairs or groups and made PowerPoint group presentations on the films, together with individual presentations on their own favorite films. The students made their own decisions regarding the content and format of their presentations. Considering that it was my first planned syllabus at university level, I thought it went very well and the students gave me good feedback. Above all, at University A I was able to encourage student autonomy and allow students to practice English in a positive environment. At university B, I had four classes on one day of the week, a total of 6 hours teaching time. I taught three Unified English classes and one Spoken English class. The first- year students in three of the four classes were majoring in Information Technology and Childhood Education, with the remaining first-year class consisting of English majors. I decided to use the same syllabi as the former teachers did the previous year. I realized all too late that it was a mistake to do this as the Unified English classes used three different syllabi with three different textbooks, all of them at a level much too high for my students, who all had a TOEIC score below 300. Moreover, the textbooks focused heavily on TOEIC testing, which I had no experience in teaching. As the level was too high, I also felt that the students were quickly losing motivation. I had a dilemma as to whether to continue with the syllabi, or to change the textbook and create my own syllabus which I could use across all three classes. As I was teaching a Unified English course, I wanted students to focus more on the essential skills for communicating in English. I also wanted to create a more positive environment where students were using English with their classmates, one of my core teaching values. After much deliberation and consultation with other teachers, I changed to a beginner level four-skills textbook a month into the semester. I had to make handouts for all the students across the three classes as the window to buy textbooks had passed and it would have been unfair to ask the students to buy another textbook. The effect of changing the syllabus was immediate. The students became re-motivated as they understood the content and they had many opportunities to practice speaking English with their classmates. As with University A, I focused a great deal on pair-work. I also had students make name cards which I would collect at the end of every class and distribute randomly at the beginning of the next class. Thus, students had a new partner for every week. This helped to create a good classroom environment where students became used to working with different partners. The decision to change the textbook was vindicated, but it was an experience I do not wish to repeat. It reinforced my belief that a teacher should be well-prepared and design a syllabus that is best suited to the needs and abilities of their students. Finally, at University C I had two classes. The title of my class was Developmental English III, a course for second-year students majoring in Engineering. I was given a four- skills textbook for both classes. Similar to University B, the students had a low ability in English. The students were also very shy and had a low intrinsic motivation for learning English, a direct contrast to the students of University A. This was the biggest challenge to my core beliefs as a teacher. It was a struggle at times to develop a rapport with the students and to motivate them. My classes became more teacher-centered and I focused more on whole-class activities, such as having students listen to audio and practice pronunciation by repeating after me. However, I also used pair-work as much as possible, even though it was difficult to get students to practice with their classmates in English for any sustained amount of time. As with University B, I used my name card system to help students become used to working with different classmates. In addition, class one had 39 students but class two only had 13 students, so it was a lot easier to get class two students to communicate with each other and to monitor what all the students were doing at any given time. At the end of the semester, I gave tests to all eleven classes at the three universities. During the semester, I had been grading students by their attendance and participation, having devised my own system that could be used in all classes. I was given sole responsibility for the content and difficulty of the tests and how they would be marked, together with how much weight I would assign to the tests for the overall grade. It was a great challenge and learning experience for me to make my own tests and set them at a suitable level for all the classes. In the end, I was able to achieve this and spent the two weeks after the semester ended marking the tests and submitting the final grades for each student. Overall, I was satisfied with my first semester as a university teacher. I had taught at three different universities and encountered varied class sizes and students with a wide range of English ability. I had to adjust my teaching methods for each class and even change the syllabus at one university. However, I learnt from each problem and used my core teaching beliefs and values to inform my decisions. I resolved to continue evaluating and improving my teaching style and methods. Predictably, one of the main differences between being an ALT and teaching at university is the amount of responsibility and autonomy allocated to each role. Most ALTs at junior high school level visit one class per week and assist the Japanese teacher of English (JTE). The ALT practices pronunciation of words and sentences from the textbook with the students and occasionally plans activities for grammar points the JTE has been teaching. Very rarely does a junior high school ALT have responsibilities beyond this in the classroom, with the exception of extra-curricular coaching for regional speech contests. The role of a high school ALT is largely similar, the rare exception being when an ALT is given their own class to teach with the assistance of a JTE. With hindsight, I was very fortunate to have had this responsibility in Takasaki as it gave me experience in syllabus planning and grading which the majority of ALTs cannot gain. On the other hand, ALTs at elementary school are often given the primary role in team-teaching, with the homeroom teachers (many of whom have no training in English teaching) taking the role of monitoring student behavior and assisting the ALT where possible. In some cases, homeroom teachers who have confidence in using and teaching English take the principal role or share the teaching of the class with the ALT. Most ALTs lead the activities in the classroom and make classroom materials to engage the students. It could be argued that elementary ALTs have more responsibility than their junior high or high school counterparts. However, almost all ALTs have little to no responsibility for classroom management, syllabus planning, or assessment. The complete opposite applies for university English teachers. In all my university classes, I had to make my own decisions, such as which parts of the textbook I would focus the most on, how to teach difficult grammar points or reading passages, and how to evaluate the students. Such a sudden increase in responsibility from being an ALT brought its own pressures, but I grew in confidence and developed as a teacher because I was given much more autonomy than I had ever experienced as an ALT. Another difference between being an ALT and a university teacher is the class sizes. The class size for elementary to high school level in Japan ranges from 20-40 students. In contrast, at university level class sizes may be as small as 10 students, or as large as 60. This calls for flexibility. A small class allows for some freedom in terms of lesson planning and flow and also allows the teacher to give detailed feedback to each student. A large class requires a great deal of classroom management, particularly for students who are not motivated and who may in turn affect the motivation of other students by their behavior. Small class sizes also allow for student-centered activities whilst large class sizes may lean towards being more teacher-centered, with more organization and planning required. In some cases, a teacher may have to establish routines and lesson structuring that a large class will instantly recognize (Harmer, 2015). Despite this, I used pair-work in all my classes, as I believe that pair-work enables students to use and practice the language with their peers, thus allowing them to share responsibility whilst also promoting learner independence (Harmer, 2015). In larger classes I had to be careful to monitor all pairs since some students tended to veer away from the task. Having students sit with a different partner every week at Universities B and C helped to avoid those issues. I also realized that there are similarities between being an ALT and a university teacher in Japan, particularly in the areas of student motivation and classroom environments. Results from recent studies suggest that students begin disliking English in junior-high school because it becomes difficult for them. They may not understand the grammar or listening and they may get low test scores which reinforces their lack of confidence. Once students begin disliking English, they may continue to feel the same way at university level (see Matsuno, 2018). Thus, both ALTs and university teachers have to deal with different levels of both intrinsic and extrinsic motivation in their students. The role of the ALT is especially important in this case, as they provide an opportunity for students to converse in English outside the confines of learning grammar and taking tests. In other words, they give students a chance to see English as a living language and as a tool to communicate with the wider world. A native speaker of English working at university can also perform a similar role, whilst also encouraging students who may have lost motivation for studying English before entering university. Both ALTs and university teachers of English should strive to create a relaxed, positive classroom environment in which students can feel comfortable learning and practicing a second language. This is necessary for any successful class no matter the age and/or ability of the students. The ALT at times performs songs and dances with the children and the university teacher often has students give presentations or short speeches which provide opportunities for positive feedback. In both cases, the students gain confidence in English and their motivation to continue using English will increase. ALTs, however, may have difficulty influencing the classroom atmosphere if they are restricted to a secondary role in the classroom. A university teacher, however, has sole responsibility for their classroom environment. Therefore, despite the differences in the two roles, it is important for all second- language teachers to create an environment where students can not only raise their abilities, but also gain confidence in their abilities, which will hopefully lead to them being more motivated to acquire the second language (Ball & Edelman, 2018). Teachers who can do this will have a successful career no matter which level of students they are teaching. My first semester teaching at University was an enjoyable and challenging experience. I relished the feeling of autonomy in the classroom but at the same time I felt the weight of responsibility in my new role. The experience forced me to assess and reinforce the core teaching beliefs and values that I had developed as an ALT. Above all, by the end of the semester I had come to the conclusion that all effective teachers of a second language share the unique quality of creating successful classroom environments where students feel at ease to learn and practice with their classmates. It is this quality that I want to continually improve upon in the years ahead. Steve Ferrier was born in New Zealand but has been living in Japan since 2005. He began teaching at three universities in Gunma and Saitama in April 2018 having previously worked as an Assistant Language Teacher. His research interests include motivation, critical thinking, and the use of visual media in the EFL classroom. He holds a Master of Arts in Screen and Media Studies. Ball, S., & Edelman, C. (2018). Self-efficacy, motivation, and perceived importance of English as an L2 among Japanese university students. The Language Teacher, 42(4), 13-18. Ferrier, S. (2017). The Takasaki Plan: Homeroom teachers’ perceptions. Speakeasy, 29, 26-34. Harmer, J. (2015). The practice of English language teaching (5th ed.). Harlow: Pearson. Matsuno, S. (2018). Japanese learners’ consciousness toward English: When do they begin to like or dislike English? The Language Teacher, 42(4), 19-23. What Simmel describes in The Stranger details my – and possibly many others’ – experience living as an immigrant in Japan, existing in perpetual flux between being a part of the local community while existing outside of it, that is, as a permanent guest. For many years, being a stranger was the defining factor of my personal identity. The concept of personal identity can be envisioned in a number of ways (e.g., Beijaard, Meijer, & Verloop, 2004; Slay & Smith, 2011; Pennington & Richards, 2016), however, in the context of this paper I would like to confine it to “an answer to the recurrent question: ‘Who am I at this moment?” (Beijaard, Meijer, & Verloop, 2004, p.108). Starting from the time I arrived in Japan I comfortably identified as a stranger. The reason why I was comfortable with the stranger identity was because I am a black-Lantinx- first-generation American. My identity resulted in me being treated as, and thus feeling like, a stranger even within my home country (see Slay & Smith, 2011). I did, and still do, take issue with this. However, I didn’t take issue with it when I arrived in Japan because it was in fact the very reason why I was here: to import qualities which cannot stem from the group itself. What better way to summarize the official job description of a JET Programme assistant language teacher (ALT), that is, “to promote internationalisation in Japan’s local communities by helping to improve foreign language education and developing international exchange at the community level” (JET Programme, n.d.). However, the longer I stayed and became involved in the community, the stranger identity shifted from being my main identity to one of a growing number of identities. Initially, this was a positive change for myself and those around me, yet, it would later result in conflict. As mentioned earlier, I came to Japan as an ALT through the JET Programme. The main job duties of an ALT are currently listed as, “team-teaching, or assisting with classes taught by JTEs/JTLs [Japanese teachers of English/Japanese language teachers]… [and] assisting in the preparation of teaching materials” (JET Programme, n.d.). However, the most prominent job description is “to interact with local communities to promote internationalisation at the local level” (JET Programme, n.d.). Therefore, my personal identity, the stranger, was also the foundation of my professional identity, i.e., the intersection of beliefs, values, and experiences an individual attributes to their person in their occupational context (Ibara, 1999; Slay & Smith, 2011). From a sociological perspective, my job as an ALT was also my social role, which is defined as “the behaviour expected of an individual who occupies a given social position or status. [It’s] a comprehensive pattern of behaviour that is socially recognized, providing a means of identifying and placing an individual in a society” (Encyclopædia Britannica, 1998). Day et. al (2006) state that “[there are] unavoidable interrelationships between professional and personal identities” (p. 603). The interrelationship of my personal identity, professional identity, and social role resulted in me being seen as and feeling like a stranger rather than an assistant teacher. This positioning resulted in no conflicts during my 5 years as a JET Programme ALT because I identified primarily as a stranger and secondarily as an ALT – this was also reinforced through the ways in which I was treated in the workplace and the community, that is, as a permanent guest. That being said, the experience provided me with an abundance of professional development such as receiving basic training via attending seminars and workshops, self-study of second language teaching, gaining valuable pedagogical insight from JTEs and other teaching staff, and learning how to communicate and function in the Japanese language and work environment. These acquired skills were influential, if not paramount, in my later direct employment as an ALT by a private high school. Before beginning my master’s degree, the aim of the lessons I made was to create an environment where students felt comfortable using English, communicating opinions and interests, but not to teach English language overtly. In my first few years at the private high school, I was what Fujimoto-Anderson (2005) describes as a language specialist, a native speaker (a stranger). The JTE was the subject specialist, the language teacher. However, the role I fulfilled within the school broadened each year. These new demands required me to become more and more of a subject specialist and closer to a teacher rather than just a language specialist; in other words, the duties of an ALT were becoming just one facet of many other duties I fulfilled. The transformation of my role moved me to make a change towards what Smith (2003) calls, “teacher-learner autonomy” which is “a capacity for self- directed teacher-learning” (p.5). It became apparent that I need further education in order to meet the growing demands of my job, so I pursued a Master’s degree in TESOL. Becoming a graduate student, I began to develop a disciplinary identity. In short, a disciplinary identity is an identity formed through the process of attaining a formal (language-teaching) education – i.e., “knowledge of such areas as: language learning theory, testing and assessment, curriculum and classroom management, applied research methods, and critical pedagogy” (Pennington & Richards, 2016, p. 14). This development began to impact my lessons, mainly by my implementing the disciplinary knowledge I was learning. In addition, the teaching staff expressed an interest in what I was learning and welcomed the transformation I was experiencing. These changes also resulted in me struggling with my stranger identity being tied to my teacher identity because I started to identify professionally as a teacher. I experienced something along the lines of an internal conflict or identity-stress, which is when “a person feels unsure about her/his identity and questions who she/he is” (Pennington & Richards, 2016, p. 7). Within the community and in the workplace my stranger identity was now one of many identities and, professionally speaking, not that relevant. In regard to the JTEs, they wanted me to be both a stranger and a teacher but found much more value in the changes occurring due to my TESOL studies. Additionally, from my standpoint, I perceived that the students also felt and valued the change to a more autonomy-supportive learning environment, fewer teacher- fronted lessons, and an improved pedagogical praxis. I was hopeful that I would be able to secure a permanent position at the high school due to almost a decade of professional performance, my growing knowledge of TESOL, and the rapport that I had developed with my coworkers over the years. It seemed as if the stranger identity was becoming of less and less value to the position, yet, the administration felt otherwise. After signing the annual contract for my 8th year I was informed that I would not be offered a contract for a 9th year. I was never given a clear answer as to why, but it was expressed that the decision was bureaucratic and not based on my performance. Indeed, through consultation I learned that the JTEs and other teaching staff were surprised and unhappy with the decision. Nevertheless, the position is currently filled by a JET Programme ALT, that is, a stranger. What I found the most interesting about this experience was that I was contacted months later by the school to help the newly-arrived ALT to acclimate to the position. This request, in my opinion, was evidence that my professional identity was viewed by the school administration as more of a teacher than as a stranger. Further, I understood that the school placed much more value on the former than the latter. Over my years living in Japan there are more identities – parent, spouse, family member, friend, mentor, student, teacher, and so on – which have superseded the stranger identity. Yet, it’s the stranger identity that still is, to some, the defining factor of my professional identity which can be problematic (e.g., Slay & Smith, 2011). As I begin my last semester of graduate school while working as an ALT, in a new but similar environment, it’s apparent that the ALT position itself has a kind of identity-stress. Perhaps better put, the position has applicant-identity-stress, as it asks for strangers, but its demands are best met by trained language teachers (Fujimoto-Anderson, 2005; Johannes, 2012). In fact, based on the yearly contract system, it employs ALTs as wanderers, someone who is here today and gone tomorrow. As I now look for EFL teaching positions in Japan outside of ALT work, it is not uncommon to see positions seeking a native English speaker, a stranger, with a substantial amount of expertise, such as publications, years of teaching experience, and so on. Yet, these positions oftentimes still involve a limited contract period with no chance of permanent employment – here today and gone tomorrow. It seems apparent that this applicant-identity- stress is systemic in language education extending beyond the ALT position. Phillip A. Bennett is a graduate student in the MA TESOL Program at Kanda University of International Studies. He has been working in the English education field at the secondary-school level in Japan since 2004. His interests are advising in language learning and teacher and learner autonomy. Beijaard, D., Meijer, P. C., & Verloop, N. (2004). Reconsidering research on teachers’ professional identity. Teaching and Teacher Education, 20(2), 107-128. Johannes, A. A. (2012). Team teaching in Japan from the perspectives of the ALTs, the JTEs, and the students. TEFLIN Journal, 23(2), 165. Smith, R. C. (2003). Teacher education for teacher-learner autonomy. In Symposium for Language Teacher Educators: Papers from Three IALS Symposia (CD-ROM). Edinburgh: IALS, University of Edinburgh. Retrieved from: http://www.warwick.ac.uk. Pennington, M. C., & Richards, J. C. (2016). Teacher identity in language teaching: Integrating personal, contextual, and professional factors. RELC Journal, 47(1), 5-23. I moved to Japan when I was 18. Having been born and raised outside of Japan to Japanese parents, I was able to speak and understand conversational Japanese but wasn’t familiar with its use outside my home. I didn’t know that I had to use a different set of words when speaking to those who were older than me, that asking questions could be perceived as belligerence, and that maintaining group harmony was more important than being “correct.” Being fluent in the language but completely oblivious to the cultural context made me what Milton Bennett (1997) calls a “fluent fool.” In fact, as my Japanese improved, it seemed like I got into more trouble because my cultural faux pas were no longer seen for what they were; I was often viewed as being intentionally rude or ill-mannered. Tomoko tells this story to her students to explain why, as their language improves, it is imperative for them to understand the cultural context in which they use the language. While being “polite” might be valued across most cultures, what constitutes politeness varies from one culture to another. This article introduces a theoretical framework for organizing a course on intercultural communication training. Based upon this foundation, it then presents a set of critical incidents that can be used in the course. We close by providing short suggestions on different ways to use critical incidents. Normally, when we enroll in a class to learn something (e.g., how to swim, how to cook) we are already (painfully) aware of why we need to learn this particular skill. For example, when Tomoko first started working for the Sheraton Hotel, she was given a computer running Windows, which she had never used before. To get any work done, she needed to learn how to use it. She signed up for a computer class where the instructor gave some basic information about using the computer (i.e., knowledge) and provided the opportunity to practice using the computer (i.e., skills). Most skills-based classes thus have two components: knowledge and skills. What makes intercultural communication training unique is that most people are not aware of why they need to learn about culture and cultural differences. They think, “If I can speak the language and I am polite, why do I need to learn about culture?” They are often not aware that what is considered “polite” or “normal” in one culture might not be so in another. When teaching culture, we also need to be aware that cultural differences can trigger strong emotional reactions. When what we value is violated, few people calmly think, “That’s an interesting cultural difference.” Instead, we often feel angry or offended. For this reason, when designing a course on intercultural communication training, Brislin and Yoshida (1994) suggest including the following four components: Awareness, Knowledge, Emotions, and Skills. In a one-year class, it is a good idea to spend at least a few weeks on helping students become more aware of how culture shapes the way they see the world — how it governs their values and behaviors. We should also help them understand how cultural differences can cause unintentional misunderstandings. Many authors have compiled various experiential activities for raising awareness about culture. Readers who are incorporating some cultural content into the language classroom might want to consult Fantini (1997). For those who are teaching a content-based course on intercultural communication or organizing a workshop where the focus is more on culture than language, Kohls and Knight (2004), Seelye (1996), Pedersen (2000, 2004) are useful resources. Those looking for a book of activities written in Japanese might want to examine Yashiro, Araki, Higuchi, Yamamoto and Komisarof (2001) as well as Yashiro, Machi, Koike and Yoshida (2009). Cultural knowledge can be divided into two types: culture-specific and culture-general (See Bhawuk, 2017 for more details). Culture-specific knowledge refers to dos and don’ts such as taking off one’s shoes when visiting a Japanese home. Unless one is organizing a class for participants going to a particular culture, teaching culture-specific knowledge can be tedious and inefficient. However, to give students an idea of the range over which cultures vary, having students do presentations on gestures across the world (Axtell, 1991) or business manners from various countries (Morrison, & Conaway, 2006) can be a fun and effective activity. In a university course on intercultural communication, teaching culture-general theories can help students organize and analyze cultural differences. While numerous theories exist, some of the classic ones include Hofstede’s cultural dimensions (Hofstede, Hofstede & Minkov, 2010), Hampden-Turner and Trompenaars’ (2011) seven dimensions of culture, E.T. Hall’s (1976) concept of high vs. low context communication, and Hayashi’s (1994) theory on M-Style vs. O-Style organizations and analog vs. digital communication. Culture tells us what is good or bad, beautiful or ugly, polite or impolite. Entering a new culture where what we value is no longer the norm can therefore trigger strong emotional reactions, which can lead to culture shock (coined by Oberg, 1960). Any course on intercultural communication must prepare students for this emotional roller coaster. Knowing that one will have a strong gut-level reaction, however, is not enough. For this reason, effective intercultural communication training often uses activities such as games and simulations to help participants experience firsthand what it feels like to have their values violated. One of the original cross-cultural simulations is called Bafa’ Bafa’ (Shirts, 1977). In this simulation, participants first get indoctrinated into the norms of either alpha or beta culture. Next, they send observers and participants to the other culture to learn about them. This is a powerful simulation that allows participants to experience what it is like to enter a new culture (awareness) and experience culture shock (emotions), while developing techniques for learning about a new culture (knowledge and skills). In Tomoko’s university class, she uses Rafa’ Rafa’, which is the children’s version of Bafa’ Bafa’. With non-native English speakers, the simpler rules make it easier to focus on the task. Ideally, 2-hours should be allotted for the simulation but it can be done in a 90- minute class. As with all simulations, however, much of the learning occurs after the simulation during the debriefing. If there is not enough time for a proper debriefing in class, students can do the debriefing on their own in the form of an essay. A simulation that is effective in allowing participants to experience culture shock in less than 30 minutes is called the Outside Expert Awareness Exercise (Pedersen, 2000, 2004). There are numerous other simulations that have withstood the test of time, such as BARNGA (Thiagarajan, 2006), which is a card game that allows participants to experience various cultures with different rules. A more recent one is entitled Rocket, which is based on the experiences of individuals working at the International Space Station (Originally developed by Hirshorn, 2010; See Kirchhoff & Yabuta, 2017 for how they adapted it for the Japanese classroom). An important note about simulations is that because they can trigger strong emotional reactions, facilitators need to be experienced. When running a new simulation, it is recommended that facilitators first experience it as a participant and then assist a veteran trainer before conducting it in class. Readers who are interested in experiencing and learning simulations are encouraged to come to the Society of Intercultural Education Training and Research (SIETAR) Japan’s monthly meetings, retreats, and conferences (http://www.sietar- japan.org/en/). A common mistake that is made in many intercultural communication workshops or classes is that too much time is spent on awareness, knowledge, and emotions with little time left for skills. Even when there is time, because intercultural communication skills cannot be easily defined, they are harder to teach. One skill that can be taught easily is the ability to analyze a well-intentioned misunderstanding by separating what actually happened (description) from the different cultural interpretations and evaluations. This technique is called D.I.E. and it is one of the most popular exercises in the intercultural field (See Nam & Condon, 2010 for more details). Another approach is to help participants cultivate their own intercultural skills through simulations and role-plays. For example, during the simulation Ecotonos (Nipporica, 1997), the facilitator creates three different cultures and participants collaborate in various business situations. As the trainer or instructor can create new cultures each time, it is possible to repeat the simulation multiple times to allow skill development. While the simulation can be completed in 2-hours, a one-day workshop allows participants to experience the simulation multiple times so they can try out different strategies. Other experiential methods that help participants develop their own skills include the Contrast Culture Method (Stewart,1966; adapted by Fujimoto, 2004) and the other is the Triad Training Model (Pedersen, 1977; adapted by Yoshida, Gimbayashi, Suzuki & Tamura, 2016). One way of raising learners’ awareness of certain aspects of culture is through the use of critical incidents. In the sense that we will consider them here, critical incidents are stories in which well-intentioned misunderstandings occur due to cultural differences (Flanagan, 1954). These misunderstandings occur because individuals from different cultures sometimes perceive and interpret the same situation differently. While well-intentioned misunderstandings occur between people from the same culture, it is more common between those from disparate cultures. The intercultural sensitizer (ICS) or culture assimilator is a collection of critical incidents that end with a number of alternative explanations for why the misunderstanding occurred (See Cushner & Landis, 1996 for a more detailed discussion). ICSs can be culture-specific or culture-general. The purpose of the culture-general ICS is to help participants understand culture-general themes. (Brislin, Cushner, Cherrie & Long (1986) and Cushier & Brislin (1996) are examples of culture-general ICSs.) To this end, instructors can break the students up into small groups and give each group a set of critical incidents that share the same theme. Students are asked to identify the theme. The ICS has been researched extensively with strong evidence suggesting its effectiveness in improving intercultural sensitivity (Cushner & Landis, 1996). However, despite this strong empirical grounding, there still exists a shortage of culture-general critical incidents written for Japanese students. In response, the authors drew on their pasts to choose events that actually happened to them, in order to create a set of critical incidents that might be salient for this particular audience. Through reading and guessing why the non-Japanese characters were puzzled by these incidents, students should be able to see the extent to which culture influences values and behaviors. Pseudonyms are used for anonymity. Naomi was visiting her friend, Keiko, in Hawaii. On Naomi’s last day, Keiko’s friend, Ricky, drove her to the airport. At the airport, Naomi got off and stood by the sidewalk and waved. Ricky waved back but Naomi continued to stand there and wave. Ricky waved back again but Naomi was still there waving. Finally, Ricky looked puzzled and asked Keiko why Naomi was still standing there. Why was Ricky puzzled? Ricky was not used to people being polite to him. Ricky was not used to people thanking him for a ride. Ricky expected Naomi to just thank him and walk away. Ricky was hoping Naomi would give him a hug. One Sunday, Sam invited four friends to go on a drive down the coast of Oregon. Dan, Rina, Akemi, and Cindy were ready to jump in when Rina started giggling and pointing at the front passenger seat saying, “Dan, I think you should sit there.” Dan looked at Rina and said, “Why, because I’m fat?” Rina giggled. There was an awkward silence and the three girls sat in the back seat of the car. As they got closer to the coast, Sam stopped at a gas station. The five got out and bought different snacks. As Dan was eating beef jerky, Rina approached him, giggled, and said, “It smells.” By the time they go to the coast, Dan was not happy. Why was Dan unhappy? As Americans tend to be sensitive about appearances, suggesting that someone is overweight is rude. As Americans tend to be sensitive about the way they smell, suggesting that someone smells is rude. Giggling can be considered rude in America. Dan thought Rina disliked her. Professor Saito was hosting Professor Jones and his wife, who were visiting from the US. One evening, professor Saito took them to a members-only club for a kaiseki dinner. They dined in a private room where waitresses were dressed elegantly in kimonos and the walls were decorated in traditional artwork. Each dish was delicious and served in exquisite plates and bowls. Professor Jones’s wife, who had read some books about Japanese culture and manners, admired and complimented each dish. At the end of the dinner, she was surprised when the proprietress of the club presented her with one of the dishes on which one course was served. She just said, “Since you were admiring these dishes, we present you with one.” Professor Jones’s wife was taken aback. She was visibly embarrassed but accepted the dish hesitatingly. Professor Saito seemed to be anticipating this gift because he came prepared and offered a return gift to the proprietress of the club, who accepted it after some hesitation. When she returned to her hotel, she asked the concierge to wrap it so she could pack it in her suitcase. The concierge admired it, saying it looks very expensive. Professor Jones’s wife was embarrassed and told him that she hoped it was not too expensive. Why do you think Professor Jones’s wife was hoping the gift was not too expensive? Because she was afraid it might break on the flight back home. Because she was worried that she committed a cultural faux pas by praising the dishes too much. Because she was worried that Professor Saito and his wife might have spent too much money on them. Because she preferred to use cheap dishes. Karen was visiting Japan with her husband. She noticed that every time she used the elevator in the hotel, the elevator operator would say, “Thank you for waiting,” even if they had not been waiting at all. One day, she went to the beauty salon. After a long and relaxing shampoo, the stylist said “Otsukaresama-deshita!” When she found out what this meant, Karen wondered why the stylist would thank her for her hard work when all she did was sit there and have her hair washed. She thought to herself, “Shouldn’t I be the one thanking her for her hard work?” Why was Karen confused? Karen was not used to people being polite. Karen was not used to being thanked for her efforts. Karen was not used to these particular greetings. Karen was used to the slow service in the U.S.A. so she did not expect to be thanked for her patience. Kayoko studied Spanish in Tokyo. The first time she went out of Japan was to a Spanish- speaking South American country for work. She stayed at a hostel for women. On her first night there, she went to use the toilet and noticed that the toilet paper roll was hung the wrong way. (The loose end hanging from below the roll instead of above the roll.) She was disturbed and thought that someone made a mistake. She turned it around. But when she looked at all the other stalls in that hostel toilet, she found that they were all hanging the wrong way. Why do you think this happened? Kayoko was staying at a cheap hostel so the service was terrible. South Americans are laid back and don’t care which way the toilet paper is hanging. They did this to annoy Kayoko. This is the way toilet paper is usually hung in this country. Jack had been living in his apartment in Japan for a few months. His Internet was slow, and he wanted to get a faster connection. He called the Internet company and asked them to install a fiber-optic line in his apartment. The Internet company told him he needed to get permission from his landlord. So, Jack called his landlord and asked him if he could install a fiber-optic line in his apartment. His landlord replied that it would be difficult to do so. Jack said he would do whatever it takes to get faster Internet. His landlord replied again that it would be difficult. Jack said he didn’t care how difficult it was; he would do anything. Again, his landlord replied that it was difficult. Jack asked if it was a matter of money, but it was no use. His landlord continued to say that it would be difficult, and Jack never got a faster Internet connection. Why didn’t Jack get faster Internet? Jack’s Japanese was not good enough. The landlord was being vague. The landlord was lazy or afraid of doing anything difficult. The landlord was hiding something. It was Lito’s first winter in Japan, and he got a sore throat. Lito always got a sore throat in winter at home, and at home the doctor always diagnosed him with strep throat, gave him antibiotics, and he was better in a few days. So Lito did some research, translated “strep throat” and “antibiotics” and went to the doctor’s. When he met the doctor, the doctor asked him what was wrong. Lito told the doctor that he had strep throat, that he always got it this time of year, and that a few days of antibiotics would make him better. Lito was trying to save the doctor some time and felt he was being very helpful. However, the doctor didn’t seem pleased. He examined Lito silently, looking in his nose and throat. After a quick examination, he told Lito that it was only a cold and he should go home, drink plenty of tea, and rest. Lito explained again that the doctor was wrong, that this was the same sickness he always had, and that he needed antibiotics. The doctor got angry and left the exam room. Lito left the clinic without paying. Why didn’t Lito and the doctor get along? The doctor made a mistaken diagnosis. Lito doesn’t have strep throat. Lito treated the doctor with disrespect. The doctor doesn’t like foreigners. Ian worked as an ALT at a Japanese school. He was invited to go along on a school bus trip. The teachers told him that since the buses were leaving at six, everyone should arrive at school by 5:45. Ian set his alarm, woke up on time, and arrived at the school at exactly 5:45. He was surprised to find that all the students and teachers were on the buses. The vice principal met him and told him what bus to get on. When he got on the bus, no one said anything to him and he could tell the other teachers were not happy. The bus started moving shortly after he sat down. Why were the teachers unhappy with Ian? The teachers were talking about Ian before he arrived. Ian mistook the arrival time. The teachers told Ian the wrong time. Sean was teaching an English class of Japanese students. He told them to talk about their dream jobs. The class was going well, and Sean was walking around the class listening to the students’ conversations. He overheard a girl telling her partner about becoming a trimmer. He didn’t understand what she meant and asked what a trimmer was. She explained that a trimmer was someone who cut the hair of people’s pets. Sean was surprised and thought the student had misunderstood the assignment. He told her that this conversation should be about her *dream* job: the job she would choose if she could be anything. He gave examples like a doctor or an astronaut. The girl promptly burst into tears and ran out of the classroom. Why was she upset? Pet-trimming is a prestigious job in Japan. The student didn’t understand the activity. The student has an unusual dream. Sean thought the student should have a more important job. After graduating from university, Stephen moved to Japan to join his girlfriend. Shortly after his arrival, he noticed that every time he entered a restaurant or a store or a hotel, the staff would say irasshaimase! Stephen would smile back and say irasshaimase back to them and bow. After noticing the shop clerks giggle or look shocked, he stopped doing this but even after many years in Japan, when he hears irasshaimase he still wants to say something back to the shop-keepers. Why do you think Stephen has this reaction? Stephen likes to make people laugh so he is trying to be funny. Stephen is used to storekeepers and customers giving reciprocal greetings. Stephen still does not understand what irasshaimase means. Stephen was annoyed by the loud greeting and wanted to show his frustration. Brad really enjoys going to Tokyo on weekends to study with his friends. Saturday classes are long and hard, but they are also interesting and he was looking forward to the class on Sunday. He got a cup of coffee and was feeling happy and energetic as he walked into the classroom. Some classmates looked a little sleepy and others had their noses in their textbooks. Makoto was sitting alone in the corner and Brad went over to him. “Hey, Makoto, how’s it going?” Makoto looked up. “Hi. You look tired!” he said. Brad felt embarrassed and didn’t know what to say. Why was Brad embarrassed? Makoto was worried about the narrator. Makoto probably didn’t do his homework for Sunday’s class. Brad thought that Makoto was rude. Brad was tired from studying on Saturday. Critical incidents can be used in many ways. An instructor can use them as an entry point to introduce a concept, theory or theme to be discussed in class. For example, how the notion of “politeness” varies across cultures (e.g., A Ride to the Airport; A Drive Down the Coast), how business customs are different from country to country (e.g., Thank you for waiting; Irasshaimase; One Night in Tokyo), how communication styles can cause misunderstandings (e.g., The Difficult Landlord; The Doctor’s Diagnosis), how “common sense” is not the same in all countries (e.g., Toilet Paper Etiquette) or how there are various concepts of time across the world (e.g., The On-Time Arrival). An entire class can also be organized around the critical incidents. For instance, each group of students can be in charge of acting out one critical incident asking the rest of the class to guess why the confusion occurred. This can then be followed-up with students writing their own critical incidents based on their experiences. Critical incidents can also be used to teach the Describe Interpret Evaluate (D.I.E.) method (see Nam & Condon, 2010 for more details). Critical incidents are a versatile tool that can address each of the components that Brislin and Yoshida (1994) contend are essential in a beneficial course on intercultural studies: awareness, knowledge, emotions, and skills. As culture and language are inextricably linked, the instruction of the two should similarly be taught together. We hope that this article has provided readers with an entry point for incorporating intercultural communication material into their language classes. Tomoko Yoshida is Professor at Keio University and Vice- President of the Society of Intercultural Education Training and Research (SIETAR) Japan. She spent her formative years outside of Japan. Bipin Indurkhya is a professor of Cognitive Science at Jagiellonian University, Cracow, Poland. He has lived and taught in many countries including India, the Netherlands, US, Japan, Germany and Turkey. John Larson has been an English teacher at Gunma Prefectural Isesaki High School for over 15 years. He volunteers for Gunma JALT in various capacities and is a big corpus linguistics wonk. Jon Dujmovich is an experienced intercultural trainer who is currently working at Keio University and serves on textbook review committees for the Ministry of Education. A longtime resident of Japan, Barry Keith teaches at the University of the Ryukyus. He also coordinates the Extensive Reading SIG of JALT. Axtell, R. E. (1991). Gestures: The do’s and taboos of body language around the world. New York, NY: John Wiley & Sons. Bennett, M. J. (1997). How not to be a fluent fool: Understanding the cultural dimension of language. In A. E. Fantini (Ed.). New ways in teaching culture (pp. 16-21). Alexandria, VA: TESOL. Brislin, R. W., & Yoshida T. (1994). Intercultural communication training: An introduction. Thousand Oaks, CA: Sage. Brislin, R. W., Cushner, K., Cherrie, C., & Yong, M. (1986). Intercultural interactions: A practical guide. Newbury Park, CA: Sage. Cushner, K., & Brislin, R. W. (1995). Intercultural interactions: A practical guide (2nd ed.). Newbury Park, CA: Sage. Cushner, K., & Landis, D. (1996). The intercultural sensitizer. In D. Landis & R.S. Bhagat (Eds.). Handbook of intercultural training (2nd ed.)(pp. 185-202). Thousand Oaks, CA: Sage. Fantini, A. E. (Ed.) (1997). New ways in teaching culture. Alexandria, VA: TESOL. Flanagan, J. (1954). The critical incident technique. Psychological Bulletin, 51(4), 327-358. Fujimoto, D. (2004). Adapting the contrast culture method to the classroom. Journal of Intercultural Communication, 7, 43-62. Hall, E.T. (1976). Beyond culture. Garden City, NY: Anchor Books. Hampden-Turner, C. & Trompenaars, F. (2011). Riding the waves of culture: Understanding diversity in global business. New York, NY: Nicholas Brealey. Hayashi, K. (1994). Ibunka interface keiei [Intercultural interface management]. Tokyo: Nikkei Publishing. Hirshorn, J. (2010). Rocket—A simulation on intercultural teamwork. Boston, MA: Intercultural Press. Hofstede, G., Hofstede, G.J., & Minkov, M. (2010). Cultures and organizations: Software of the mind (3rd ed.). New York, NY: McGraw-Hill Education. Kirchhoff, C., & Yabuta, Y. (2017). Intercultural simulation Rocket: Adapting it to a Japanese college classroom. Journal of Intercultural Communication, 20, 199-212. Kohls, L.R., & Knight, J.M. (2004). Developing intercultural awareness: A cross-cultural training handbook (2nd ed.). Yarmouth, ME: Intercultural Press. Morrison, T., & Conaway, W.A. (2006). Kiss, bow, or shake hands (2nd ed.). Avon, MA: Adams Media. Nam, K.-A., & Condon, J. (2010). The DIE is cast: The continuing evolution of intercultural communication’s favorite classroom exercise. International Journal of Intercultural Relations, 34(1), 81-87. Nipporica Associates (1997). Ecotonos: A multicultural problem solving simulation. Nicholas Bradley. Oberg, K. (1960). Cultural shock: Adjustment to new cultural environments. Practical Anthropology, 7, 177-182. Pedersen, P. (1977). The triad model of cross-cultural training. Personnel and Guidance Journal, 56(2), 94-100. Pedersen, P. (2000). Handbook for developing multicultural awareness (3rd ed.). Alexandria, VA: American Counseling Association. Pedersen, P. (2004). 110 experiences for multicultural learning. Washington DC: APA. Seelye, H.N. (1996). Experiential activities for intercultural learning. Yarmouth, ME: Intercultural Press. Shirts, G. (1977). Bafa’ Bafa’: A cross-cultural simulation. (https://www.simulationtrainingsystems.com). Stewart, E.C. (1966). The simulation of cultural differences. Journal of Communication, 16(4), 291-304. Thiagarajan, S., & Thiagarajan, R. (2006). Barnga: A Simulation Game on Cultural Clashes (25th anniversary ed.). Boston, MA: Intercultural Press. Yashiro, K., Araki, S., Higuchi, Y., Yamamoto, S., & Komisarof, K. (2001). Ibunka communication workbook [Intercultural communication workbook]. Tokyo: Sanshusha. Yashiro, K., Machi, E., Koike, H., & Yoshida, T. (2009). Ibunka training: Borderless shakai wo ikiru [Intercultural training: Living in a borderless world]. Tokyo: Sanshusha. Yoshida, T., Gimbayashi, R., Suzuki, S., & Tamura, Y. (2015). The triad training method for collectivists. Journal of Intercultural Communication, 19, 151-165. This is probably not the best explanation. Ricky was used to people thanking him for a ride. This is not the best explanation. While it is possible that Ricky wanted Naomi to hug him, it does not explain why he was puzzled by her action. This is a good answer. While complimenting a friend about their looks is appropriate, telling them they have gained weight or they look old can be considered rude in some cultures. This is a good answer too. People from certain countries are very sensitive about the way they smell and spend much time on personal hygiene. While giggling is not rude, the Japanese habit of “waratte gomakasou” often puzzles people outside of Japan. This is a good answer too. When this happened, Dan asked Cindy if Rina disliked her. Later that night, Rina confided in Cindy that she had a crush on Dan. Confused, Cindy asked her why she did what she did. Rina explained that kappuku ga ii is not necessarily a bad thing in Japan and she was just trying to say that the beef jerky smelled good (oishiso). Although this is possible, it does not explain why she was embarrassed. This is a good explanation. Professor Jones’s wife might be worried that the proprietor felt pressured to give her a gift because she complimented the dishes too much. This is a good explanation. Gift-giving differs greatly from culture to culture. Expensive gifts are exchanged regularly in some cultures while not in others. For those who are not used to this custom, it might make them feel uncomfortable or suspicious about an ulterior motive. This is not the best explanation. There is no indication of this in the story. This is not a good explanation. Karen was used to people being polite, just in a different way. This is not a good explanation. Karen was used to being thanked for things she did. This is a good explanation. In many cultures, service personnel may say “Thank you for waiting” only after customers have been waiting for a while. Additionally, what is considered “a while” or what is considered “good service” differs from one culture to another. This is probably not the best explanation. If Karen had been waiting for a few minutes, she would not have questioned the greeting. Although this is possible, this is not a good explanation. This is probably not a good explanation. If this were true, then the toilet papers would not all hang in the same direction. This is probably not the best explanation. This is a good answer. While we often assume that there is a “correct” way to do things, often these customs vary from country to country or even from family to family. This is a good answer. It may be that Jack interpreted the Japanese word for difficult literally, when in this case the landlord may have used it to mean impossible. This is a good answer. The landlord may have avoided strong words like “can’t” or “impossible” because of a cultural indirectness. It is important however, to be careful of words like vague when describing other cultures, as they can carry a negative connotation. This is probably not the answer. Jack made it clear that he would bear any costs, so it is more likely there was a breakdown in communication here. This is probably not the answer. To some the landlord’s actions may seem suspicious, but a communication breakdown is far more likely. This is possible, but there is no way to be sure. Lito’s symptoms were the same, but that doesn’t guarantee it is the same sickness as the one he got at home. This is possible, but there is no way to be sure. The doctor’s exam was quick and not enough for a certain diagnosis. This is a good answer. Lito was only trying to be nice, but the doctor may have seen this as an imposition on his authority. This is possible, but there is no way to be sure. This doctor might treat all his patients like this. This is possible, but it only raises important questions such as what the teachers were saying. This is a good answer. Ian arrived at the time appointed, but concepts such as early and late are often viewed differently in different cultures. This is possible, but it is more likely that Ian mistook two concepts: 1) the nominal arrival time and 2) the time which culture dictates he should have arrived. If this sounds illogical, remember that in some cultures it is perfectly natural. This is a good answer. If the teachers were aware of cultural differences regarding time between Ian’s culture and their own, perhaps they should have anticipated his misunderstanding as to what time he should arrive. This is probably not the answer. However, it is also not wise to assume that a popular job in your culture is also popular in another culture. This is probably not the answer. The student is probably upset because being a pet-trimmer *is* her dream job and Sean couldn’t comprehend that. This is a good answer. Being a pet-trimmer may be an unusual dream job in Japan. It is always important to remember that there are unique individuals in any culture, and that not everyone in a culture corresponds to that culture’s norms. This is a good answer. Sean probably thinks that a pet-trimmer is not a very important job, and this is a value judgement. It may be a valid judgement in his culture, but not all cultures necessarily share those values. This could be partially true, but it is not the best answer. This is probably not the answer. The fact that he has stopped repeating it indicates he has some idea of its meaning and/or usage. This is a possible answer as many non-Japanese are often surprised and sometimes annoyed by the strong, high-pitched tone used by shopkeepers in Japan. This answer could be partially true. Makoto could have been concerned about narrator’s condition, or well-being. But it’s not the best answer. This is incorrect. We don’t know whether Makoto did his homework or not. This is the correct answer. In the narrator’s culture, to make negative comments about another person’s physical appearance is considered impolite or rude – unless you are very, very close friends. It is rude to say “you gained weight” or “you have pimples” or “you look tired” or “your hair is thin”. Even though it may be a sign of concern in Japanese culture, it unacceptable in many other cultures. This answer is incorrect. The author was definitely not tired. As humble instructors will admit, it’s inevitable that, at some point in our careers, we foreign language teachers will find ourselves caught up in prioritizing the grammar and syntax portions of language teaching over cultural learning and understanding. That is to say, culture is often considered secondary and even ignored as lessons are prepared. It’s easy to forget that we are bringing two very distinct cultures together when we introduce a language to non-native speakers. It has been my experience, from teaching Spanish in the Midwest of the United States to EFL in Japan, with a stop-off in the Amazon rainforest in between, that cultural instruction and understanding are of upmost importance for both language teacher and pupil. Furthermore, I have found that the cultural concepts students bring to their studies have a considerable influence on their ability/desire to acquire an L2. Therefore, through this paper I seek not to prove or disprove any major linguistic theory, but rather share some insights I have gained through working in these three very distinct cultural settings. In doing so, I anticipate that these insights may encourage readers to reevaluate what implications culture holds for the language classroom. Earlier this year, I came to work to find a book on my desk. The first thing I noted was its title, which was quite provocative, Don’t Sleep, There are Snakes, by Daniel Everett. The post-it affixed to the book, from a JTE co-worker, said that he thought I would find this book interesting. He knows me well. Indeed, the title caught my attention, but the subtext, “Life and Language in the Amazonian Jungle,” and the sight of a gringo man swimming in an Amazon tributary, on the cover, had me immediately turning the pages. Daniel Everett, now Dean of Arts and Sciences at Bentley University in Waltham, Massachusetts, was a Christian missionary and aspiring linguist when he decided to move to a remote village in the Brazilian Amazon, to live among the indigenous Pirahã people. His original intent was to learn the tribe’s language so that he might successfully convert the people to his religion. During his time in the Amazon, he made surprising observations about the way the Pirahã culture guides and dominates how they use their language. Furthermore, rather than successfully converting the Pirahãs, it was he who would experience profound change in his belief system. Certainly all of this appealed to me, as I too had felt the “call of the wild” Amazon, when I was a younger, raging idealist. I know I had great schemes and visions in my mind for how I would go off to a small Ecuadorian Amazon community and teach. And, just as was Everett’s experience, I found the Amazon and its people had a lot more to teach me than I them. It surprised me, though it shouldn’t have, that the culture my students in the Amazon brought to the table should so strongly shape their willingness and ability to learn the language I wanted to teach them. After all, I had already had experiences with a very similar revelation, trying to convince university freshmen, in Indiana, of the need to learn Spanish. During my tenure as an ALT in Japan, I’ve noted even more how Nippon culture shapes language-learning (and often language frustrations). I have Don’t Sleep, There are Snakes to thank as the catalyst to me finally getting these observations down. The concept of cultural intelligence is relatively new. Fortunately, I have personal access to insights from a study of cultural intelligence that was conducted at my alma mater by my wife, Daniela Báez. She published her doctoral thesis, Cultural Intelligence in Foreign Language Classes, about the impacts of language learning on our understanding of other cultures. As she pointed out, “The concept of cultural intelligence was only created and introduced to the educational areas of social sciences and management in 2003” (Báez, 2012, pp. 15-16). Fortunately, despite the newness of the notion, we have ways to measure the cultural intelligence of individuals. There are four mechanisms that are considered for measurement, which include cognitive, metacognitive, motivational, and behavioral skills and abilities. These four parts are interdependent, but I’m most interested in the motivational portion (Earley & Ang, 2003). I believe that student motivation is heavily influenced by their culture, which, in turn, heavily regulates their willingness and ability to learn language. We evaluate the motivational aspect of cultural intelligence to better understand an individual’s “…desire to learn more about cultural differences and how to interact around people from different countries” (Báez, 2012, p. 19). This first became apparent to me when teaching elementary Spanish courses, as a graduate student at Indiana State University. As part of this course, which was a requisite in the university’s foundational studies program, students were asked to keep a language learning journal, to document how they felt about their studies and progress. Among my students’ reports for the motivating factors of their choice, I noticed a common thread. Namely, many students reported having selected Spanish because the university was requiring they choose a language and they heard Spanish was “the easy language.” I’m afraid many of them were considerably disappointed after experiencing the time and effort one must put in to develop an understanding of even the fundamentals of Spanish verb conjugation. Evidently, many of the students I had in my Spanish courses weren’t exactly thrilled about the idea of learning another language to begin with. A near majority of them were in my courses because they had opted out of language studies in their high schools. I recall many students expressing sentiments of an “I don’t need to learn another language, everyone else speaks English” nature. More times than not, these students struggled the most. I believe their opposition was a precondition, formed in their culture. As an Indiana native, I am willing to make a judgement call and say that rural Indiana isn’t always open to the idea of multiculturalism. In some ways, we could argue that the “English-only” culture, which is clearly present in the environment where I taught Spanish, produces students who are recalcitrant to learning other languages and cultures. This could also be linked to the racial threat hypothesis. It’s difficult to deny that a culture of fear creates language learning barriers. I came across an article about the damage English-only policies in the Philippines have brought about, which I think is applicable here. Isabel Martin (2014) explains, “… students will not learn a language if they fear it…[not] recognizing the multilingual context of teaching and learning…only reinforces fear of the language” (p. 79). Finally, I don’t want to give the impression that all of my students carried a culture of opposition with them to Spanish-learning. I also had the pleasure of working with some very highly-motivated students in those Spanish classes. Perhaps the most motivated were the “heritage learners.” These students were typically Latinx, with Spanish-speaking grandparents, great-grandparents or further removed family members. I found that the background knowledge and/or cultural connections these students possessed produced the expected end product; that is, they had more successful learning outcomes. Look around, we are in the jungle! I spent a year working alongside 4 other American teachers in the Amazon. We learned to live, adapt, and work in the jungle. We found that ambiguity, a relaxed sense of time, and environmental awareness of our little community held big implications for how our students would approach learning. “Chris-tindi, why are you so stressed all of the time? You need to relax, this is the jungle!” This is an example of how a typical conversation between me and the school chef at the Amazon boarding school I lived at for a year would start. Though his name was Efrain, everyone called him Mono (Monkey), and I could never find out why. This ambiguity was not unusual, and it shaped how many things were said, done, and learned in Mondaña community, in the Ecuadorian Amazon. I learned to embrace this kind of vagueness of meaning and enjoy its main purpose, to jest and relax. Mono was the community’s biggest jokester. He loved to call everyone [Name]-tindi, and everyone would have a good laugh when he did. The laughter was stronger still when you would ask anyone what it meant. To this day, I have to rely on the less than credible explanation, from Mono himself, that tindi means strong in Kichwa. I feel that, in many ways, the air of ambiguity in our learning environment had a lot to do with our surroundings. There was certainly a lack of urgency or stress amongst the students. After all, WE WERE IN THE JUNGLE. Over time, I found that this lack of urgency meant our students were either uninterested or unable to contemplate their long-term language goals. People in the Amazon seem to be more solidly anchored to the present, “Which bird is that singing just feet away from where Chris-tindi is trying to teach?” I could relate to what Daniel Everett (2009) describes as an immediacy of experience principle, which he observed as a cultural constraint among the Pirahãs to limit their exchanges to the present moment (p. 132). Our students were uninterested in reading a book written 50 years ago; they found little value in that. They wanted to learn the things that would work for them right away, things they could readily apply to their lives and their interests. “My name is Dalia. I’m from the Coca City. I study eco-tourism at the high school. Welcome to my community. Thank you.” As I listened to another student sadly drone on, with her memorized speech, prepared to introduce herself to the tourists who would come to their community, I realized this kind of learning wasn’t useful for her. The students wanted to be able to share their knowledge and culture of the Amazon with the visitors, they wanted to tell them about what was going on in the jungle and the importance of the Pachamama, the earth/time mother. They also needed to know how to talk to tourists and hotel guests, as well as do things like teach them how to take a better picture of that cute little green tree frog they came across. This type of language has a specific purpose, and we visiting teachers learned to utilize it in instruction; their culture didn’t allow for learning the trivialities of languages, which we often tend toward in EFL and other fields. Similarly, my fellow teachers and I needed to learn to be aware of our surroundings as well. The time we spent in that little Amazon community taught us how to embrace the cultural dissimilarities between our students and us, in order to become better educators and learners. I didn’t know it then, but I would carry those understandings across the Pacific, to employ countless times in Japan. If you have a work and/or social life in Japan, it’s inevitable that you will find yourself uttering a set of standard phrases daily, the aisatsu. Japanese society values routine language formulas. Yuri Kumagai (1994) expands on this in her paper about how Japanese culture affects language-learning. She claims that, “For the Japanese, these expressions are dictated by social rules, rather than by individual choice” (Kumagai, 1994, p. 29). I would agree. This is why I’ve been asked, countless times, “How do you say otsukaresama deshita in English?” It’s why my one-on-one conversations with students are often painfully limited: Q: “How are you?” A: “I’m sleepy.” Or, as a colleague of mine recently discovered with her English class, there are dozens of ways to say gambare in English. It also explains every ALT’s favorite inside joke, “Hello everyone, how are you,” and the collective response, “I’m fine, thank you. And you?” Our students anticipate these types of formulaic exchanges in English as well, and often struggle to cope with the ever-expanding nature of Western- English expressions. Are you staying woke? In Japanese conversation, it is neither uncommon nor unacceptable for a response to a question or an explanation of a concept to be rather lengthy, with very limited (often one word) utterances of acknowledgement from the receiver. I think there is a culture of respect for the speaker and a recognition that he or she is expected to say their piece to the fullest. I liken this to bowling. The speaker throws the bowling ball down the lane (expounds on a point lengthily) and we wait to see how many pins are knocked over (the overall idea of what was said). This often contrasts with the “tennis style” westerners expect in conversation. This can frequently be seen in English class, where what the teacher thought was a question requiring a very short response produces an extensive or complex answer, with a great deal of thought put into it. In a less theoretical sense, my “culture matters” approach to language instruction has helped me grow as a professional and an individual. If you take cultural influences in language learning into account, you can craft altogether better lessons and form much stronger relationships with your students and co-workers, in an international setting. In Japan, this has led me to explore new teaching strategies such as student-centered learning, Ask Answer Add (AAA) conversation, Japanese Lesson Study (jugyo kenkyu), and even taking a serious look at how Japanese students learn mathematics. All of this has steered me in the direction of developing a deeper respect and understanding for language variations (the American Spanish, the Ecuadorian English, the Nippon English) and cross-cultural instruction. If you strive to prioritize culture in your instructional strategies, I doubt you will be disappointed in the results. We hear a lot of talk about our increasingly globalized world, but, if our students and educators are to be ready to encounter and succeed in it, we must all become more culturally intelligent. Christopher Mackenzie Baumunk is currently an ALT on the JET Programme, teaching at Gunma Prefectural Maebashi Senior High School, Japan. He has a passion for bridging the gap between language educators and learners from diverse countries, backgrounds and cultures. He is interested in the opportunities bringing together international students presents with regards to making our world a better place. Earley, P. C., & Ang, S. (2003). Cultural intelligence: Individual interactions across cultures. Stanford, CA: Stanford University Press. Everett, D. (2009). Don’t sleep, there are snakes. London, U.K.: Profile Books Ltd.
Gleason, H. S. Jr. (1961). An introduction to descriptive linguistics. New Delhi: Oxford and IBH Publishing Company. High is 86, low is 57, sunrise at 6:19, and sunset at 4:46. This is what my second hometown is like this time of the year—San Diego, California. Being born and raised in Gunma, Japan, I never expected that I would call this place my second hometown. Although I truly love and enjoy living here, I always miss my true hometown. My first JALT meeting was back in 2015, after coming back from the exchange program at San Diego State University. At the time, I vaguely started thinking about applying for Master’s programs in the U.S. I’d always wanted to become an English teacher at the secondary level in Japan, but the experience at State and the time at the JALT meetings have had a major impact on my life. During the exchange program, I learned the value of teachers who understand the relationship between linguistics and language teaching. JALT meetings and the knowledgeable members also gave me opportunities to think about practical issues in EFL teaching which could relate to theoretical aspects in linguistics. After attending some of the meetings, I became interested in teaching at the higher education level as many of the Gunma JALT members. In 2016, after graduating from Gunma University with a BA in education, I got back in San Diego and started the MA program in linguistics at San Diego State. As I had known some professors and graduate students since the exchange program, that was a simple choice to come back here and continue my education. Now, while working on my third semester as a graduate student, I’m teaching Japanese to undergraduate students. Although my major interests are language acquisition and teaching in EFL settings, I have learned so much from the teaching experience at State. In next spring semester, I’m finishing all of the requirements. I originally wanted to stay in the States after the program, but I decided to go back and get working experience in EFL teaching. In summer, I will take the teacher’s license exam in my hometown. Although I will leave here for a while, if I keep dreaming, I can always come back to the States and resume studying, I believe. I’d like to express my special thanks to Mr. John Larson and Mr. Raymond Hoogenboom for giving me this great opportunity to contribute to the Speakeasy. I’m also grateful to Gunma JALT for having a major impact on my life. I wish the Speakeasy another successful year ahead and hopefully I will be back to Gunma JALT soon in the near future! Is it “Katakana-English” or “Katakana English”? Whichever way one frames it and perceives it, it is unquestionably both liked and loathed and is one of the commonly debated subjects in ESL discourse in Japan, particularly with regard to acquisition of the English sound system. Indeed, the prevalence and practice of Katakana-English pronunciation is often held in a negative light and is frequently criticized for impeding students’ learning. While criticism of this nature tends to come from so-called native speakers, English instructors, or learners concerned about the accuracy or authenticity of their pronunciation, there are also advocates for its use and a distinct market for it in the Japanese publishing industry. Perhaps simply responding to market demands, the publishing industry has arguably played a significant role in perpetuating and encouraging the use of Katakana-English. This paper explores this phenomenon by first tracing the use of Katakana-English in Meiji period school textbooks which are then compared and contrasted with a recent publication from 2016 entitled 怖いくらい通じるカタカナ英語の法則 (Uncannily effective rules of getting by with Katakana-English). Essentially, I attempt to demonstrate how the English language-learning publishing industry in Japan has played a major role in perpetuating pronunciation problems among Japanese ESL learners. Just what is Katakana-English? While some people may confuse Katakana-English with 外来語 (gairaigo) or so-called loan words such as インターネット (internet) or トマト (tomato), in this paper I use the term “Katakana-English” to refer to the use of katakana inside the Japanese L2 classroom. In a context of IT inundation and increased internationalization, it is little wonder that loan words comprise 10 to 15% of everyday Japanese vocabulary and 80 to 90% of IT-related vocabulary (Olah, 2007). Assuming that the presence and ongoing adoption of loan words is unlikely to cease, it is thus perhaps not unreasonable to suggest that the adoption of loan words is partly accountable for the perpetuation of Katakana-English. While loan words might be part of the problem, what is more concerning is the ongoing practice of using ふりがな (furigana; i.e. kana characters printed beside words) rather than phonetic spellings as a pronunciation key in texts and social contexts. This custom dates back to the Meiji period—when katakana syllabary without a clear purpose after being superseded by hiragana for kanji pronunciationwas pressed into service to represent written Western loan-words (外来語). In ancient Japan, imported Chinese characters formed the foundation of written language, but by the 19th century the Japanese writing system was firmly established and katakana was chosen to replace all written gairaigo (Walker, 2010, p.109). According to Walker, this single decision resulted in three serious consequences: first, the original English word has been removed from cognitive recognition; second, the katakanized word has been branded “forever foreign”; third (and perhaps most damaging communicatively), the katakana script has been used as a pronunciation guide (Walker, 2009, pp.82-85). Wang, Higgins and Shima go on to argue that, “The English of many Japanese learners cannot be understood by non-Japanese speakers because of either poor or Katakana pronunciation,” adding that “Even though a few university English teachers are trying very hard to improve their students’ English pronunciation, many times, the effects are limited,” (Wang et al., 2005, p.39). The reasons for this, according to the authors, are that Japanese students who are corrected more frequently than others tend to lose interest in learning pronunciation, private one–to-one pronunciation training is costly, and “pronunciation training is currently delayed beyond the age when children’s tongues and mouth muscles are flexible” (Wang et al., 2005, pp.39-40). If we accept that these circumstances are still valid, then what are the options to learn or improve one’s pronunciation? If we take into account that: 1) schools and institutions do not have a standard or universal method of teaching pronunciation; 2) private lessons are expensive; and 3) the suggestion that Japanese students generally dislike being corrected in front of others, then perhaps one of the major alternative options of learning pronunciation is through self-study—and self-study involves books, software or other applications. More importantly, however, self-study requires tremendous amounts of motivation. For that reason, players in the self-study industry in Japan have tried to address this problem by marketing self-study as something fun, easy and effortless. Take for example, Everyday English (http://every-e.com/). Upon accessing the website, the first thing one sees on the top page is a large banner which boasts that Everyday English has been providing “Japan’s leading English Education Materials for Seven Consecutive Years.” It also makes claims such as, “一日たった5分聞くだけ英語が聞き取れる・話が通じる“(Just listen for five minutes a day and your listening comprehension and ability to express yourself in English will improve.) The focus is on the learning process being easy, relaxing, and seemingly passive. This is reinforced by one of the customer testaments made on the YouTube video embedded on Everyday English’s website: “One of the important things is the easiness […] Many Japanese people make effort to study English very ‘stuffly’ […] The most important thing is the easiness of learning” (エブリデイイングリッシュ,2012). I can’t pick up what people are saying à You’ll listen to two individual voices in a short conversation and you’ll start to pick up what they’re saying. You’ll increase your vocabulary, too! I can’t speak à You’ll pick up expressions frequently used by foreigners in no time! People can’t understand what I’m saying à You’ll be able to produce clear and authentic pronunciation—just like a native speaker! I can’t make conversation à You’ll learn simple and useful expressions applicable to many situations. I’ll end up forgetting everything I learned à Don’t worry! Because you’ll be listening every day, you’ll maintain your English skills. In addition, Everyday English notes reveals its three secrets to success—that is, just listen and learn, no texts necessary; listen to native speakers speaking at natural speeds; use frequently used English in situations where you are most likely to use English such as for travelling purposes, omotenashi purposes, business, passing tests, listening to Western music, and so on (Everyday English, 2017). Although it sounds rather ideal and attractive, it is certainly a questionable method in terms of its effectiveness. Needless to say, this is not a stand-alone case. This is simply one example of a self-study service in a publishing industry such services and products. While these kinds of products are readily available online or in bookstores that are simply responding to market demands, universities also provide a number of such texts. For an example, I chose the most recently published from over 20 listening and pronunciation-related books available at Asia University’s library. Published in 2016, 発音とスペルの法則: 英語の教師・学習者のために (The rules for spelling and pronunciation: For English instructors and learners) seems to be a reasonable title on the premise that there are certain rules and patterns which pertain to spelling and pronunciation. However, opening the text reveals quite a number of chapters and pages that rely heavily on kana pronunciation guides. Considering that this text was found in a university library, I anticipated that major bookstore chains would stock such items to a greater extent. To ascertain this, I visited one of the most prevalent secondhand bookstores in Japan, Book Off. A quick glance at the English textbook shelf revealed that the same kind of fare was available at popular book vendors. However, the emphasis on ease of study and effortless improvement seems to be reinforced more extremely by titles such as: 先端脳科学者による一ヶ月簡単英会話脳トレ (Easy English conversation brain training in a month according to a leading neuroscientist), 3単語ですぐ話せる (Learn how to speak immediately using just three words), 中学レベルの英単語でネイティブとペラペラ話せる本 (Speak fluently with native speakers using Junior High School-level vocabulary) or 絵で見てパッ！と言う英会話トレーニング (Speak everyday English instantly through pictures). Easy, quickly, and fluently. That seems to be the emphasis in the self-study industry, but how is it relevant to the use of ever-present Katakana-English? Simply put, Katakana-English is easy and comfortable for Japanese learners. , when reading a beginner’s Japanese textbook for the first time, most European learners of Japanese will probably encounter ローマ字 (Romanized Japanese characters) in the textbook and/or a large chunk of the textbook might be written in Japanese, but there are vital issues such as accuracy and authenticity which accompany Japanese textbooks written in ロマー字. In the initial stages of language learning, it might be acceptable as a transition tool, but as students develop, I argue that authentic L2 pronunciation training and textual input should be emphasized. While the use of ローマ字 Japanese textbooks or Katakana-English in contemporary English textbooks is not uncommon, what was the situation like over 100 years ago when Katakana-English flourished in Meiji period English textbooks and language learning resources? To see how Katakana-English has influenced the publishing industry in present day Japan, it is essential to track back to the days when English education in Japan was in its infancy – in the Meiji period. Even at that time, quite a number of texts were available not only to instructors, school, college or university students, but some books were also available to the average consumer. In any case, the first of the texts I selected, 英語発音秘訣 (English pronunciation tips) was written and published by Kikuchi Takenobu and published in 1886. Figure 3 is one of the excerpts from the text which seems to indicate that the text might have some linguistic merit, or at least suggest that the text is encouraging learners to produce authentic or intelligible pronunciation of English sounds. However, the kana pronunciation guides which start to appear further into the text seem to nullify any attempts to encourage students to strive for accuracy or produce a variety of sounds (see Figure 4). The second text in my sample, 和英発音原理 (The principles of English pronunciation) was written and published by Ikeda Tomoyasu in 1888. At first glance, the title seems to imply that the text is possibly based on linguistic theory or empirical studies in the field. Furthermore, much like the former text, the oral diagrams at the beginning of the text seem promising and useful, however the inclusion of pinyin-like diacritical marks, as well as katakana further into the text, just seem to complicate things on the learner’s part (see Figures 5 to 7). Needless to say, Chinese was learned long before English was introduced in Japan and Sino-Japanese relations were significant in the late 19th century, so it is understandable why a pinyin-like guide to pronunciation might have been applied. While the texts introduced thus far seemed to market themselves on their scientific foundations, Imamura Gentarou’s Practical English Conversation (1899) appears to have targeted a more general market. However, upon reading the text, the results reveal otherwise. First and foremost, the Japanese title (英和実用会話: 簡易速成) is somewhat different from the English translated title, as it suggests that the reader can learn practical English quickly and easily. The introduction to the text further emphasizes the need to study “easy and practical” English in the late 19th century (see Figure 8). Essentially, the book starts by introducing a Romanized katakana chart followed by a spelling guide featuring some phonics, which are all complemented with katakana pronunciation guides (see Figure 9 and 10). After several pages of these pronunciation guides, the book then introduces basic vocabulary sets such as numbers, pronouns, prepositions, and greetings. This is then followed by more specific vocabulary sets such as terms of address and vocabulary used specifically for business and trade purposes. Unsurprisingly, katakana and errors are everywhere to be seen (see Figure 11). Aside from the use of kana in vocabulary sets, there are also sentences in the “short phrases” section written entirely in katakana (see Figure 12). Themes and contexts include talking about the weather, shopping, illness, telling the time, and making future plans, and so on. The overt reliance on kana and the lack of explanations of either grammar or form arguably imply that the focus is not on mastering the basics of the language for sustainable language acquisition. Rather, the focus is simply on rote learning and reproducing. Further into the text there is a dialogues section. Once again, the example sentences are supplemented with full sentences of kana for pronunciation guidance. Dialogue contexts include at the hatter’s, at the tailor’s, at a shipping broker, at a play-things shop, at a fruit shop, asking a way (asking for directions), and similar situations one might encounter when travelling or living abroad. While not all contexts may have been relevant, many of them were fairly plausible situations, considering that the book was published at a time when a number of students and scholars were studying abroad in England or serving in the military between the Sino-Japanese war and the Boxer Rebellion. To cater for the latter type of students, less general dialogue contexts include talking about a soldier (Figure 13) or a police man. Evidently some dialogues were rather lengthy and arguably impractical—reinforcing that the emphasis is on simply rote learning the katakana pronunciations. Towards the end of the book, a guide for letter writing is included. Rather surprisingly, even the template for writing letters placed katakana above every lexical item. The purpose of this seems a little unclear since letter writing generally does not involve articulation. In any case, after this section, the text ends abruptly with the Romanized forms of common Japanese names, names of prefectures, towns, and currencies. Perhaps the author and publisher had legitimate reasons to select the specific content I noted and present it in an arbitrary fashion, but rather than being concerned about the content or structure of the text, I am concerned about the overwhelming use of katakana, the simplified spelling chart, and the assumption that one can drastically improve one’s speaking and pronunciation skills through rote learning of katakana-ized phrases. Although not entirely impossible, self-study is arguably not the best way to improve one’s conversation and pronunciation skills. Having said that, if we take into account the context, specifically, the fact that many students in pre-war Japan were learning English for military or trade purposes (and quickly at that), then this text may well have been a valuable resource for them. In addition, given that Japanese education has roots in Confucian culture, rote learning is still emphasized and practiced in many learning contexts even to this day. Due to these reasons, I argue that the supply and demand of these simplified speed-learning texts has probably been consistent for over the last 150 years or so. Having considered several texts from the Meiji period, let us now turn to the current situation in the self-study publishing scene in Japan. Have texts or people’s attitudes towards language learning changed? At least we can acknowledge there are a great variety of texts and learning tools available now, but as I will demonstrate, there are the exceptional few authors whose attitudes have not changed. These are the people who perpetuate speed-learning culture and even take pride in maintaining the Katakana-English tradition. One of these authors and one of these texts is the aforementioned怖いくらい通じるカタカナ英語 (Uncannily effective rules of getting by with Katakana-English) written by Ikegaya Yuji and published by Kodansha in late 2016. However, prior to examining the text itself, it is necessary to briefly consider the author’s background. Believe it or not, Ikegaya holds a Ph.D. in pharmacology and is currently employed as a professor in the same field at Tokyo University. He studied abroad in New York for two and a half years and his experience of being unable to both comprehend and produce naturally-spoken English was the inspiration for this book. Also, there is a disclaimer section in the introduction where Ikegaya claims three things: 1) That being born and raised in Japan, it is too late for him to cultivate and produce authentic English pronunciation (a belief based on scientific evidence), so he can only produce a katakana accent; 2) Due to the reasons in 1), his pronunciation is beyond repair and incomprehensible; and 3) Despite 1) and 2), he found that when he changed the katakana characters slightly, his English apparently became more intelligible (2016, p.7). He goes on to admit that he is not an English professor, nor did he receive any special English education. Therefore, the methods of pronouncing Katakana-English introduced in his book are, by his admission, not perfect and the book itself is not suitable as an English textbook or for students taking English exams. Nevertheless, Ikegaya still believes that it is a suitable resource for Japanese EFL learners who want to be understood by Americans and/or communicate and sound like near-native speakers, even if they are not perfect (2016, p.7; p.37). He understands that linguists believe that Katakana-English is a terrible way to learn pronunciation, but defends his stance by stating that he is not aiming for perfection – he is merely “giving a gift” to absolute beginners of English or people like him, who have simply given up hope on being able to converse smoothly and accurately (2016, p.8). He believes it is futile to strive for perfection, therefore using Katakana-English is apparently acceptable. In fact, Ikegaya even claims, without providing any references, that the neural circuits of Japanese brains were not built for English pronunciation. In all honesty, Ikegaya knows that his methods will be criticized and “made fun of,” but he insists that it is simply because people who are good at English do not understand the feelings of those who are not (2016, p.31). Ikegaya then starts the book by offering advice to his readers. First, in order for these absolute beginners and hopeless learners to overcome their issues with communicating in English, Ikegaya argues that they have to reset everything they have been taught about English and deeply consider the notion that Katakana-English might actually be a good thing. Once learners grasp this, according to Ikegaya, they will maintain their motivation levels and continue practicing enthusiastically. But how long can one practice enthusiastically or maintain these levels of motivation? According to Ikegaya, readers should practice the same example sentences 70 times (2016, p.9). He does so without justifying why. Although subject to debate, I find this boot camp-like approach to language learning hardly sustainable for most learners. In Part II and Part III of the book, Ikegaya covers what he calls a “Practical English course for beginners” in which phrases are arbitrarily introduced. There is very little structure, if any. Furthermore, the English introduced is largely casual and colloquial and localized to reflect various situations one might encounter in New York which. In regards to the slight alterations to the Katakana-English that Ikegaya makes, it is obvious that he has made the alterations based on a typical New York accent. While that may be resourceful for those living or moving to New York, it does not really cater for people who need to be able to understand a variety of English speakers. Take, for instance, the following excerpt (Figure 14) where you can see some examples of this particular variant of Katakana-English. For example, becomes ナラロウ(nararou). Furthermore, on each page, there is also a QR code that connects the reader to the MP3 recordings of the phrases being spoken by a Japanese learner and a so-called native speaker. After pages of these collections of arbitrary phrases, Part IV becomes even more problematic. In this section, Ikegaya introduces and explains 13 specific rules that must be learned and drilled. There are also four supplementary rules thatcover exceptions and irregular pronunciations. However, before covering the supplementary rules, I will provide a brief overview of the 13 rules, followed by the rather challenging practice questions (Figures 15 and 16). With words ending in (-TANT), only the (N) is slightly voiced. After studying these rules, readers are then encouraged to attempt the “Practice Questions” (Figure 23). For example, instead of “ボストン” (Boston), the Ikegaya-recommended pronunciation is “バッスン.” Debatable to say the least, but as the disclaimer reminds us, this is not a work of linguistic merit. Now aside from the 13 “standard” rules that Ikegaya provides, he also acknowledges that there are exceptions – four of them, to be precise. The first is the notorious /L/ and /R/problem. Ikegaya claims that the Japanese brain cannot differentiate between /L/ and /R/ very well, and he adds that to aim for perfection is simply impossible (2016, p.165). Again, he argues this without providing empirical evidence or studies to substantiate his claims. On a positive note, for the first time in the book, Ikegaya explains (without diagrams) how to produce the (L) and (R) sounds, respectively. (L), he says, can be produced by simply biting one’s tongue, whereas (R) can be produced by keeping one’s tongue suspended in one’s mouth, not touching anything at all. The second exception is the (B) and (V) problem. Ikegaya suggests that (B) is equivalent to the バ行 (ba, bi, bu, be, bo row) in Japanese, while (V) is produced by biting the lower lip. He further adds that it is understandable if learners cannot tell the difference between (B) and (V), but notes that ヴ is a better alternative when producing (V) sounds. For example, village =ヴエレッジ. The third exception to his rules is related to the trouble many Japanese learners of English have with distinguishing (F) from (H) sounds. For Ikegaya, (F) is simply produced by biting one’s lower lip, while (H) is equivalent to the ハ行 (ha, hi, fu, he, ho row) in Japanese. Rather simplistic considering the pronunciation of フ (fu) is quite different than (hʊ). For instance, the word “hook” would still be pronounced as “フック.” The final exception Ikegaya touches on is one of the most notoriously difficult to pronounce, the (TH) sound. This is probably the first time in the book that the phonetic symbols are introduced: namely, Θ and ð. In spite of this, Ikegaya suggests that the standardザ (“za”, the common katakanization of the word “the”) should be traded for ダ, and therefore using the タ orダ行 (‘ta’ and ‘da’ rows, respectively) will suffice to produce (TH) sounds as long as one bites their tongue. Considering the variety of Englishes one may be exposed to living or working in a globalized context, this is perhaps one of the more useful rules. Taking into account the difficulty that many learners of English with Asian language backgrounds have with (TH), I would argue that this rule is fairly reasonable, but not a standard by any means. First, he argues that adult beginners give up on the idea of mastering English. For Ikegaya, English is just a tool (2016, p.184). While giving up on perfection is a reasonable suggestion, striving for excellence is not necessarily bad. Although the Katakana-English method may be considered an easy way out for people who are not particularly good at speaking English, Ikegaya argues that it does involve a lot of hard work. Namely, one has to repeat the phrases 70 times (2016, p.197). Again, no empirical evidence or reasoning behind this required number is outlined. Children should be exposed to English from a very young age if they have any hope in becoming better English speakers. For Ikegaya, once you get old, it is “too late.” (2016, pp.178-179, p.207) The former claim holds some validity, but the latter claim is certainly debatable. For some, it is never too late to learn a language—it just requires more effort. Japanese learners cannot differentiate between (R) and (L) sounds because there is no (L) in Japanese. Furthermore, due to a lack of exposure to (L) and contexts in which one can practice or use it, as an evolutionary phenomenon, Japanese people’s ability to pick up or distinguish (L) devolved (2016, p.165). Evidently, Ikegaya’s claims seem to be informed by evolutionary theory and biological determinism. The problem with this is that he denies the argument that newborns have the ability to pick up a variety of phonetic input and listen for phonetic detail (Werker and Tees, 2014, p.509). Everyone is arguably born with this capability, but exposure to linguistic input is necessary to develop these skills. It is quite problematic to assume that Japanese children are born with the ability to only hear Japanese sounds. Without needlessly searching for, let alone reading contemporary speed-learning texts, it is evident that there is a market for them and that they continue to be published. In all fairness, would it not be nice to learn another language with little to no effort? While instructors might look down on rote learning and the use of Katakana-English, it is essential to take into account the learners’ needs, the English language learning environment in Japan, and the publishing industry’s response to its consumers needs. On this note, and in short, what I have tried to argue in this paper is that the publishing industry in Japan is partly responsible for perpetuating ザ ・カタカナ・イングリシュー. However, this is possibly due to the fact that there is a great demand for it and unfortunately, it seems like the respective supply of speed learning materials advocating the use of Katakana-English pronunciation seems to show no signs of slowing. While this is beyond the control of English instructors, what they can do is try to understand their students’ needs, maximize the time spent on pronunciation in class, and stress the importance of producing intelligible English. As futile as it may be to simply undo a tradition of Katakana-English pronunciation spanning over a century, striving to produce intelligible (if Katakanized) English is at least a feasible pursuit. Originally from the state which boasts the happiest animal on earth – Western Australia, Antonija Cavcic is currently a visiting faculty member at Asia University. Although she finally completed her PhD in late 2017 (and is in desperate need of a break), Antonija remains involved in research concerning both Japanese popular culture and English language education in Japan. Goutou, H. (2010). 先端脳科学者による一ヶ月簡単英会話脳トレ (English conversation brain training in a month according to a leading neuroscientist). Tokyo: ASCII Media Works. Ikeda, T. (1888). 和英発音原理 (The principles of English pronunciation). Tokyo: Hakubunsha. Ikegaya, Y. (2016). 怖いくらい通じるカタカナ英語の法則 (Uncannily effective rules of getting by with Katakana-English). Tokyo: Kodansha. Imamura, G. (1899). Practical English conversation. Tokyo: Shobundo. Kikuchi, T. (1886). 英語発音秘訣 (English pronunciation tips). (n.p. ): Kikichi Takenobu. Kosuke, J. (2004). スラスラ日常英会話 (Smooth everyday English conversation). Tokyo: Kirihara. Masuda, K. (2016). 発音とスペルの法則: 英語の教師・学習者のために (The rules for spelling and pronunciation: For English instructors and learners). Tokyo: Parade Books. Nagamura, K. (2007). 3単語ですぐ話せる (Learn how to speak immediately using just three words). Tokyo: Kanki Publishing Co.
Ōgane, M. (1999). 中学英語で英会話を一週間攻略する本 (Conquer Junior High School-level English conversations in a week). Kyoto: PHP. Olah, B. (2007). English loanwords in Japanese: Effects, attitudes and usage as a means of improving spoken English ability. Bunkyo Gakuin Daigaku Ningen-Gakubu Kenkyuu Kiyo, 9 (1), 177-188. Walker, R. (2009). Barrier to communication? The use of Katakana-English by Japanese students. Essays and Studies, Tokyo Woman’s Christian University, 60(1). Walker, R. (2010). Katakana-English in a world of Englishes: Identification and recognition. Essays and Studies, Tokyo Woman’s Christian University, 60(1). Wang, S., Higgins, M., & Shima, Y. (2005) Training English pronunciation for Japanese learners of English online. The JALT CALL Journal, 2005, 1(1), 39-47. Werker, J. and Tees, R. (1999). Influences on infant speech processing: Toward a new synthesis. Annual Review of Psychology, 50(1), 509-535. Williams, N. (2010). 中学レベルの英単語でネイティブとペラペラ話せる本 (Speak fluently with native speakers using Junior High School-level vocabulary). Tokyo: Daiyamondosha. Yamada, N. (2011). 絵で見てパッ！と言う英会話トレーニング (Speak everyday English instantly through pictures). Tokyo: Gakken. Therefore, the main focus was on giving fifth and sixth graders a chance to become familiar with English in a casual environment, such as by singing or playing games (Aoki, 2016). The annual number of 45-minute lessons for both fifth and sixth grades was set at 35. Since 2009, English textbooks have been distributed to elementary school students in the fifth and sixth grade. The first textbook, Eigo Note, was used from 2009-2011. In 2012, it was replaced by Hi Friends. Both textbooks supplied teacher manuals, together with DVD-ROMs. Following this, MEXT published its “Execution Plan for the Reform of English Education in Response to Globalization” in December, 2013 (Kambaru, 2016). Under the proposal, MEXT will upgrade English to an official subject in the fifth and sixth grades from 2020, after a two-year transition period. Students will study all the English skills – namely speaking, listening, reading, and writing – as well as grammar. The number of classes will increase to three per week. Along with that, foreign language activity classes will become mandatory for third and fourth graders (Aoki, 2016). Therefore, at the present time, whilst fifth and sixth graders are given official lessons in foreign language activities, there exists no official or standardized curriculum for English classes for grades one to four. It is left to each local Board of Education, and by extension, to each school, to design and implement their own curriculums and lesson plans for those lower grades. English has been taught as an unofficial subject or as a foreign language in Takasaki elementary schools for a number of years. The classes were usually team-taught by an Assistant Language Teacher (ALT) and a homeroom teacher (HRT). However, the frequency and content of the lessons varied according to both the school and the grade. Before 2009, most ALTs worked at junior high schools and were sent to elementary schools a handful of times every year, for a period of one or two weeks each time. Therefore, students in many elementary schools in Takasaki had few chances to be consistently exposed to English or to interact with ALTs. Therefore, students graduating from different elementary schools would attend the same junior high school with different levels of English ability. This was a problem that was experienced by both teachers and students across Japan (Ikegashira, Matsumoto & Morita, 2009). From 2009 however, most elementary schools in Takasaki were visited by an ALT at least once a week, with English being taught to fifth and sixth graders for 35 lessons a year using the Eigo Note textbook. Therefore, fifth and sixth graders were now learning English from a standardized curriculum. Grades one to four also had English lessons (at a much lower frequency than grades five and six) but there was still no standardized curriculum for these lower grades. Instead, each school had its own lesson plans. In 2015, the Takasaki Board of Education announced that it would implement a standardized English curriculum for all grades in Takasaki elementary schools from April 2016. First to fourth graders would have one English lesson per week. Fifth and sixth graders would have two English lessons per week. The curriculum became known as the “Takasaki Plan”. Whilst almost all elementary schools in Takasaki would use the Takasaki Plan it was not compulsory for them to do so. Rather, the Takasaki Plan was seen as a sample curriculum that could be adjusted depending on the level of the students in each school. In addition to this, Takasaki also greatly increased their number of ALTs to a current total of 84, one for each elementary, junior high and high school under the auspices of the Takasaki Board of Education. Indeed, some elementary schools at present have two ALTs, who divide the workload of teaching English to all the grades in the school. The lesson plans for grades one to four were based on the Jonan Elementary School English syllabus. Jonan was seen as a benchmark for elementary school English classes in Takasaki, and ALTs visited once a year to observe, participate in, and discuss lessons. After adopting the Jonan elementary school English syllabus, the Takasaki Board of Education stated that the goal for first to fourth grade students was to become familiar with English as a foreign language. For example, students should be able to understand the differences between Japanese and English sounds and be able to feel foreign cultures and have an understanding of them. First and second graders should try to imitate the pronunciation of certain words that they hear in everyday life and should be able to understand the name in English of certain things around them when they hear them. Third and fourth graders should be able to have a conversation about simple topics and should try to actively connect with each other through simple interaction (Takasaki Board of Education, 2016, p. 7). The lesson plans for grades five and six were based on the Hi Friends textbook, which was issued by MEXT. A DVD-ROM was also provided that includes chants and alphabet puzzles, along with “jingles” in which students can practice saying the phonetic sounds of each alphabet letter. Fifth and sixth graders would focus on all four English skills. The goals for these upper-grade students included being able to convey their own thoughts and ideas about familiar things using simple expressions, being able to understand simple content by analogy, and being able to read familiar phrases or sentences with the help of pictures, scenes, or speech models. In addition, students should be able to recognize and write all small and capital letters of the alphabet by the end of the sixth grade (Takasaki Board of Education, 2016, p. 7). Therefore, whilst grades one to four would become increasingly familiar with various vocabulary and expressions, grades five to six would be able to use those vocabulary and expressions to communicate with each other in activities such as interviewing and group presentations. How many years’ experience do you have teaching at the elementary school level? Do you think it is necessary for students to learn English in elementary school? What do you think of the Takasaki Plan? Have you made any adjustments to the lesson plans? Has your role as a homeroom teacher in English class changed? What changes would you like to see made to the Takasaki Plan in the future? The participating teachers wrote their answers in Japanese. Their surveys were then collected and translated into English. The following section provides details of the homeroom teachers’ answers to the survey questions together with the author’s own opinions and suggestions regarding the results. Q2: Do you think it is necessary for students to learn English in elementary school? Eleven out of the twelve participants thought that students should learn English in elementary school. One of the reasons given was that elementary school students are more accepting of English than junior high school students and are more motivated to learn. Harmer (2015) states that younger children, from five years upwards, “are enthusiastic about learning (if it happens in the right way),” and “learn best through play and other enjoyable activities” (p.82). Elementary school lessons involve a lot of communicative games and songs in which students can enjoy talking or singing in English. Some teachers also commented that English was a global language and thus Japanese children should start learning and becoming familiar with English from an early age. In this way they could become participants in a global society. If Japanese children are exposed to English at an early age and their interest in foreign languages and cultures is stimulated, there is a strong possibility that they will continue to be interested and motivated to learn English and to travel abroad as well as interact with foreigners in Japan. In this way, Japan can have increasingly strong connections with a global society. Only one participant answered that they did not think it was necessary for elementary school students to learn English. This homeroom teacher believed that students should focus more on Japanese, including writing Kanji and expressing themselves in their native language. According to Aoki (2016), “[…] discussions on the issue through the 1990s found many people opposed to teaching English in elementary school because they thought it would confuse children who hadn’t even learned their mother tongue yet.” It must be recognized that learning how to communicate in one’s mother tongue is crucial to a young person’s development. However, it must also be noted that homeroom teachers spend most of the day with their students and a strong bond develops between them. The classroom atmosphere or the students’ motivation may be affected if the homeroom teacher is not motivated to use English or fails to see any reasons to teach it. There is little option but to respect the opinions of all teachers and to have open dialogues with them on the topic of teaching English in elementary school. Q3: What do you think of the Takasaki Plan? Eleven out of the twelve participants answered that the syllabus was both easy to teach and easy to understand. One teacher responded that the syllabus was difficult to understand and another teacher stated that it was difficult to teach. All lesson plans for each grade have detailed explanations of activities, together with vocabulary and expressions to be taught. The structure of most lessons is consistent in that a song or chant is followed by a warm-up activity, introduction or review of vocabulary or expressions, and finally one or two main activities. The aim of the lesson is highlighted, which allows HRTs to write it on the blackboard at the beginning of the lesson so that students can understand what they will be focusing on. In turn, students also write the aim of the lesson on their reflection cards, called furikaeri, and at the end of the lesson they write what they learnt or enjoyed doing. However, there are some lesson plans in which the activity is too detailed or difficult to understand in both the Japanese and English versions of the syllabus. If teachers are confused as to how to do an activity then the students may in turn be at a loss which can lead to frustration or loss of confidence and motivation. Therefore, it is necessary for HRTs and ALTs to have regular meetings to discuss the lesson plans and to make adjustments if necessary. What must be stressed is the great benefit of having a standardized curriculum. ALTs and HRTs from different schools can now meet to discuss the same lesson plans or share adjustments they made, either in person, or in online discussion groups. Both ALTs and HRTs can improve their classes with feedback from their peers. In addition, the Takasaki Plan should be edited on a regular basis with input from both HRTs and ALTs to amend the details of some lesson plans. There was less agreement on whether the level of the syllabus was suitable for the students. One participant said that the level was easy; six others stated that the level was suitable; and five teachers answered that the level was difficult. In public elementary schools, ability can vary a great deal between classes and individual students. What one student finds too easy may leave another student frustrated because he or she cannot understand. Therefore, it should be left to each HRT’s discretion (in consultation with the ALT) whether to adjust the vocabulary, expressions or activities in each lesson plan since they know their students much better than the ALT who only visits each class once or twice a week. There was also no real consensus on whether the students had improved in English since the implementation of the Takasaki Plan. Seven teachers said that their students had improved, whilst four teachers said they had not really improved. One teacher did not answer. The Takasaki Plan is only in its second year of use and therefore more time is needed to ascertain if students have improved their English skills. Without doubt, elementary school students in Takasaki have much more exposure to English than previously, and this should lead to a greater familiarity with English and a greater confidence to use the language to communicate with others, even with very simple greetings and phrases. Moreover, with a standardised curriculum, sixth graders across Takasaki should be able to write and read both small and capital letters of the alphabet, as well as understand the phonetic sound of each letter. This should make them better prepared for the first grade of junior high school compared to previous years when a wide discrepancy in the amount of English taught in each school resulted in elementary school graduates with considerable variances in their English abilities. Q4: Have you made any adjustments to the lesson plans? Some teachers have been making adjustments to the lesson plans detailed in the syllabus. Four teachers stated that they select some activities that their students particularly enjoy and use them on multiple occasions. For example, activities such as the missing game and karuta can be used for many sets of vocabulary. One teacher commented that they sometimes change some details or steps in an activity if they think their students would find it too difficult to understand. Two more teachers stated that they consult with the ALT and other homeroom teachers in the grade before making any adjustments to the lesson plan such as changing some vocabulary or adjusting a worksheet. In the elementary school where the survey was conducted, the homeroom teachers of each grade have weekly meetings with the ALT to discuss the upcoming lessons. The Takasaki Plan does allow for some flexibility in its lesson plans. What is important is that HRTs and ALTs have regular meetings to discuss what adjustments are to be made. However, as the Takasaki Board of Education advised, fifth and sixth grade lesson plans should not be adjusted too much since the aim should be to have sixth graders graduating from elementary school with similar abilities in English. Q5: Has your role as a homeroom teacher in English class changed? There were a range of answers to this question. One teacher stated that they were using more English in class such as “Good job,” “Listen carefully,” “Stand up” and “Sit down.” One teacher thought that the HRT’s role is to support the ALT and that it was important that the ALT be an effective teacher. Another teacher commented that the ALT should be the main teacher (T1), but that the HRT should gradually assume the role over time. In addition, one teacher thought that it would be difficult for the HRT to be the T1, but that they should try to lead some lessons or activities. Finally, one teacher stated that the HRT should be the main teacher, with the ALT acting in a supporting role (T2). Many HRTs have very little training in teaching English. According to an education ministry survey in 2015, only 4.9 percent of elementary school teachers were licensed to teach English (Aoki, 2016). In addition, many teachers do not have confidence in speaking English or pronouncing English words since, according to Kambaru (2016), “They learned English through direct deductive explanations of grammar and remembering words one by one in a junior and a senior high school” (p.15). Therefore, it is understandable that some HRTs are anxious about teaching English to their students. However, with the implementation of a detailed syllabus, together with a large increase in the number of lessons, elementary school teachers can become gradually more knowledgeable of simple English vocabulary and expressions. Also, they can become more confident in teaching English, or at least participating more in the lessons. The role of the HRT may change dramatically when English becomes an official subject for fifth and sixth graders from 2020. The HRT may be required to lead the class or specialist teachers of English may teach the classes with an ALT. Until that time, it should be left to each homeroom teacher to define their role in the classroom in relation to the ALT and to discuss this with the ALT. Another reason for HRTs not participating fully in the English lesson is that they may feel they have to monitor students’ behaviour and in turn discipline some unruly students so that their class remains focused. This can be a difficult problem to overcome. One suggestion is to have another member of staff monitor the students with behavioural problems so that the HRT can participate more fully in the English activities. Q6: What changes would you like to see made to the Takasaki Plan in the future? In response to the last question on the survey, some teachers suggested changes or adjustments to the syllabus. One teacher thought that there should be more listening exercises so that students could improve their comprehension skills. Another teacher commented that there should be more visual aids and more listening resources. The use of visual aids (flashcards or actual physical objects) in the elementary school classroom in any subject is crucial since younger learners are stimulated and motivated by visual materials. Harmer (2015) states that younger children, “use everything in the physical world (what they see, do, hear and touch, etc.) for learning and understanding things” (p. 82). ALTs should be responsible for making flashcards that are both colourful and easy to comprehend. Moreover, some of the worksheets included in the Takasaki Plan can be improved upon by making them more eye-catching with better pictures to capture the students’ interest. Again, this should be the responsibility of the ALT. Another teacher commented that the ALT should be a trained teacher. There should be more discussion or debate on whether ALTs should be experienced, trained teachers or merely native English speakers keen to introduce their countries’ cultures. No matter how experienced or motivated an ALT is, they should be given opportunities to improve their teaching skills. New ALTs should attend seminars and have regular discussions with more experienced ALTs who can share ideas and teaching methods, either in person or online. Without doubt, a standardized curriculum gives them more opportunities to do this. Finally, one teacher observed that while students had become used to regular English classes, they were not sure how much English the students were learning or acquiring. This comment brings into question how much English students in Japanese elementary schools should learn or acquire. Certainly, students should be able to read and write the alphabet and understand the phonetic sounds of most letters by the time they enter junior high school. This would give JHS teachers more time to focus on more advanced English in the first grade. Students should also be able to communicate with each other using simple phrases, such as talking about favourite things and daily schedules. Above all, students should be familiar with regular English lessons and feel uninhibited in trying to use English. Finally, it remains to be seen what the effects will be of making English an official subject for fifth and sixth graders from 2020. Specialist Japanese teachers of English (JTEs) may be employed, and there is also the question of how the students will be graded and whether this will affect their motivation and enthusiasm to learn English. Above all, there should be a continuing dialogue between junior high schools and elementary schools, so that students can have a smooth transition in their English learning between the sixth grade and their first year in junior high school. The survey was useful in giving homeroom teachers from one elementary school in Takasaki an opportunity to express their thoughts on the Takasaki Plan and for providing suggestions for the future use of the syllabus. Almost all the teachers thought that students should be learning or becoming familiar with English in elementary school and that the Takasaki Plan was easy to understand and teach. Some teachers thought that the syllabus was not set at a suitable level for their students and therefore they made adjustments to some lesson plans. There were differing viewpoints on the HRT’s role in the English classroom, such as thinking that the ALT should be the main teacher or, on the other hand, commenting that the HRT should be the T1. Finally, some teachers thought that more visual aids and listening resources should be provided so that students are more exposed to the English language and in turn increasingly stimulated and motivated. A limiting factor of this research was that only twelve participants were selected to answer the survey. In the future, a greater number of homeroom teachers across a range of elementary schools in Takasaki should be interviewed about the Takasaki Plan in order to get a greater consensus or range of opinions. It is unclear how long the Takasaki Plan will be in use given that MEXT has stated its intention of making English an official subject for fifth and sixth graders (and foreign language activities mandatory for third and fourth graders) from 2020. If an elementary school English curriculum becomes standardized across Japan, the Takasaki Plan may be discontinued. However, it can be strongly argued that the Takasaki Plan, with its easy to follow but flexible lesson plans, has made for smoother English classes in elementary schools. Moreover, with a standardized curriculum, both ALTs and HRTs can discuss the same lesson plans with teachers from different schools across Takasaki. Mutual feedback amongst teachers can only lead to better lessons for their students. No syllabus is ever perfect and every syllabus should be constantly evaluated and revised in order to make it better for both teachers and students. This should be the case for the Takasaki Plan for as long as it is in use. Aoki, M. (2016). English Heads for Elementary School in 2020 but Hurdles Abound. The Japan Times, 5 September 2016. Harmer, J. (2015). The Practice of English Language Teaching (5th ed.). Pearson. Ikegashira A., Matsumoto, Y. & Yoshiko M. (2009). English Education in Japan – From Kindergarten to University. In: Reinelt, R. (Ed.) (2009). Into the Next Decade with (2nd) FL Teaching. Rudolft Reinelt Research Laboratory EU Matsuyama, Japan, pp. 16-40. Kambaru, A. (2016). Japanese Elementary School Teachers’ Perceptions About English Teaching. The Tsuru University Review, no.83 (March, 2016), pp. 11-18. Takasaki Board of Education (2016). Elementary School English & Foreign Language Activities Teaching Plan (高崎市小学校英語科・外国活動指導計画). Speakeasy's modern print and digital layouts were lovingly designed by Terry Dassow.